Any links on this page are not affiliated and are just there to help you out. How Many Miles per level? 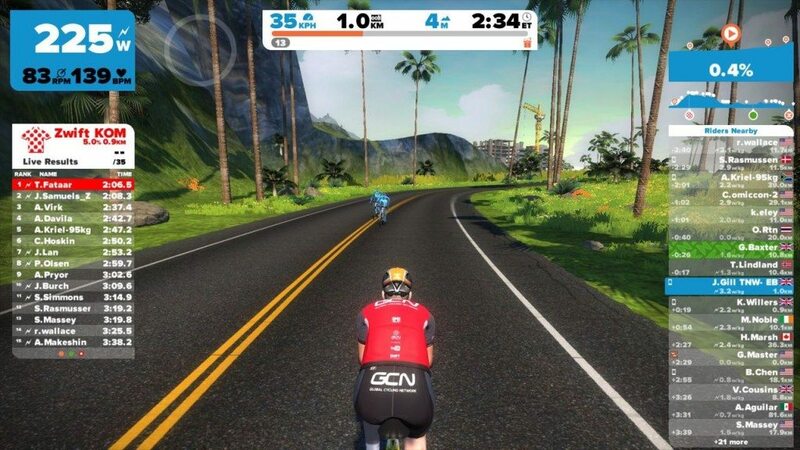 What do you need to get into Zwift? 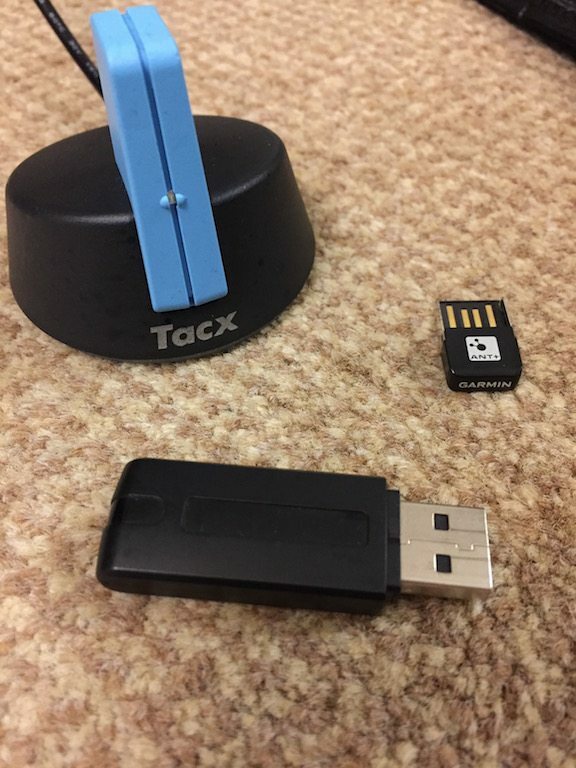 What ELSE do you need to get into Zwift? 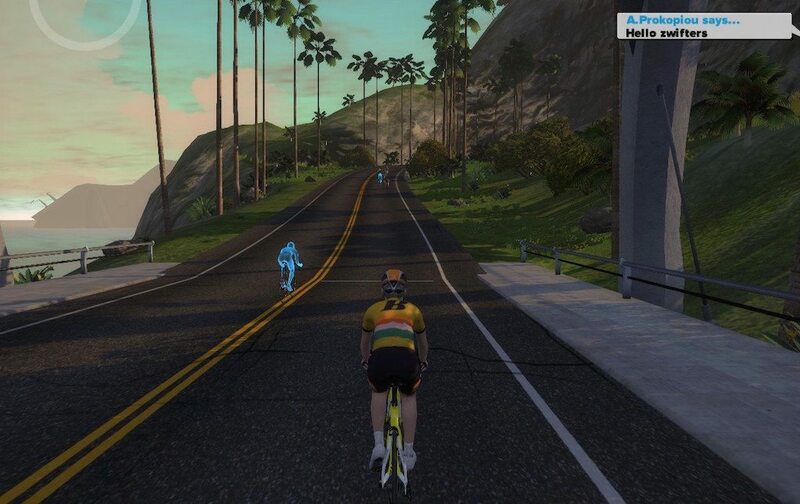 A computer capable of running Zwift, so Mac or PC currently. 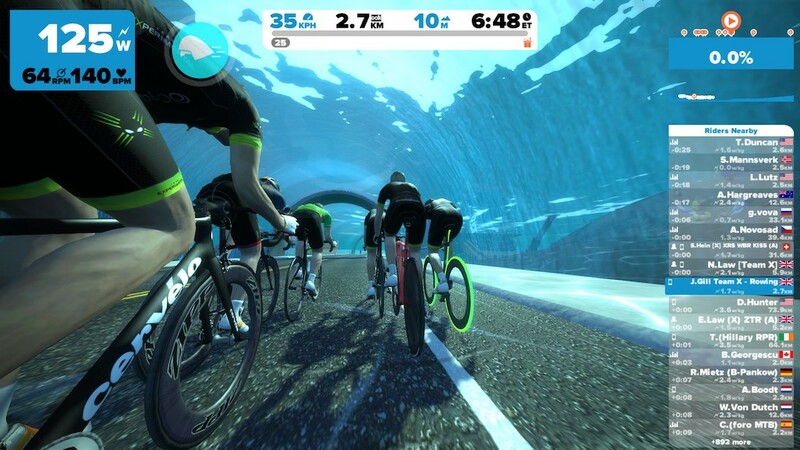 You know this is an indoor BIKE training game yes? 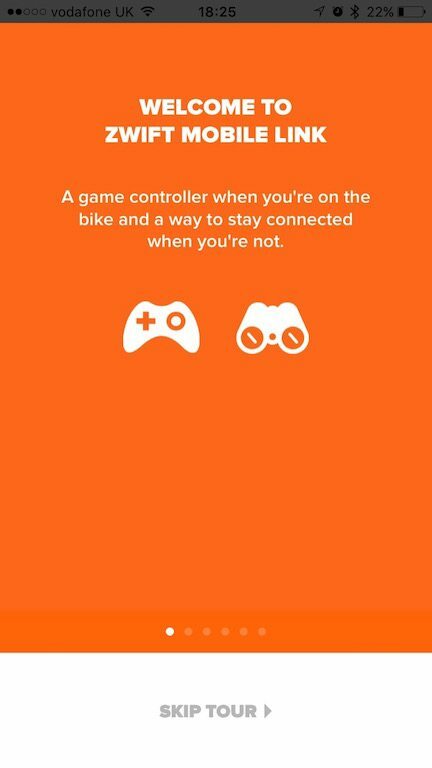 Otherwise, your bike is just an uncomfortable seat for your computer! 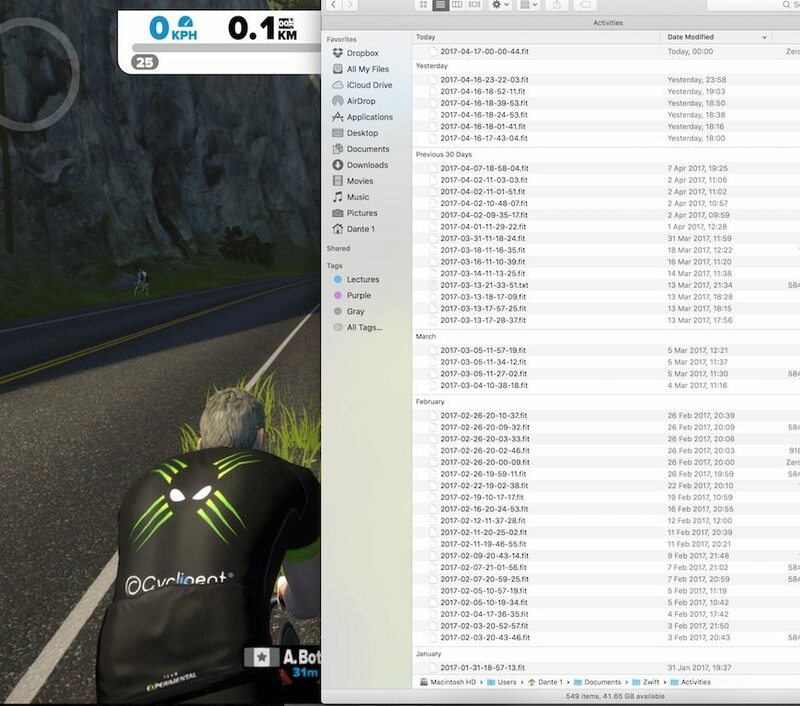 This is how your cycling kit will communicate with Zwift on the computer – frankly its the most important part of the system after a turbo trainer and bike! 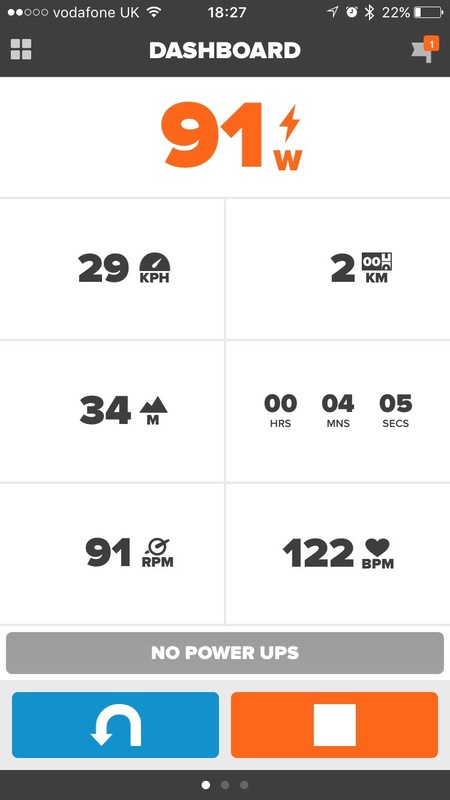 Power meter – Currently only ANT+ compatible. 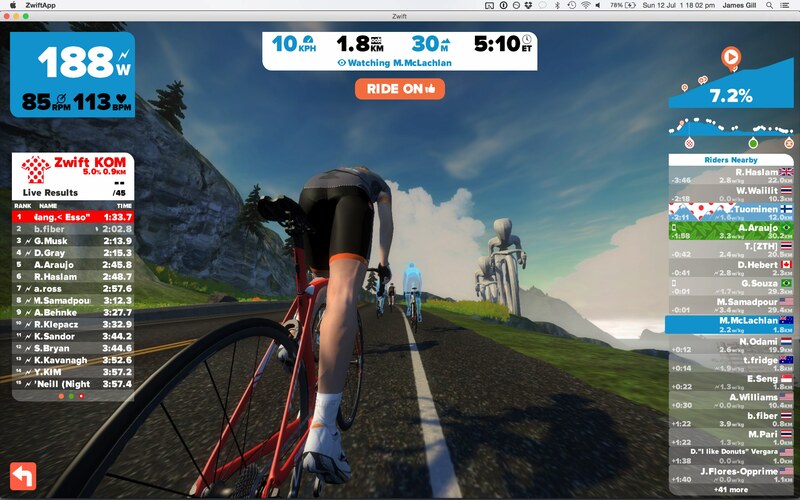 After the install, Zwift checks for updates – this will happen every time the game loads. It’s important to log into a few minutes before a race, just in case there is an update pending. You don’t want to miss the start simply due to a software update! 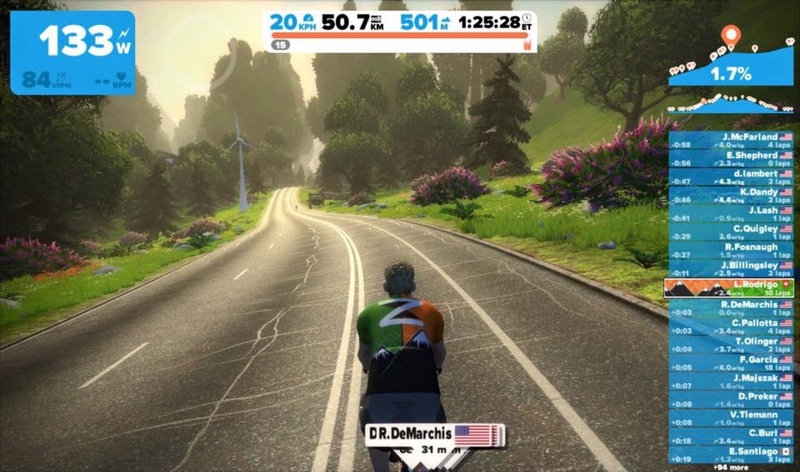 The loading screen details several things about Zwift, most notably Zwift Boosts/power-ups, and any other information that is current. The previous “Ride with Jens Voigt” Event was advertised on here. So it’s worthwhile having a quick look when the system is booting. 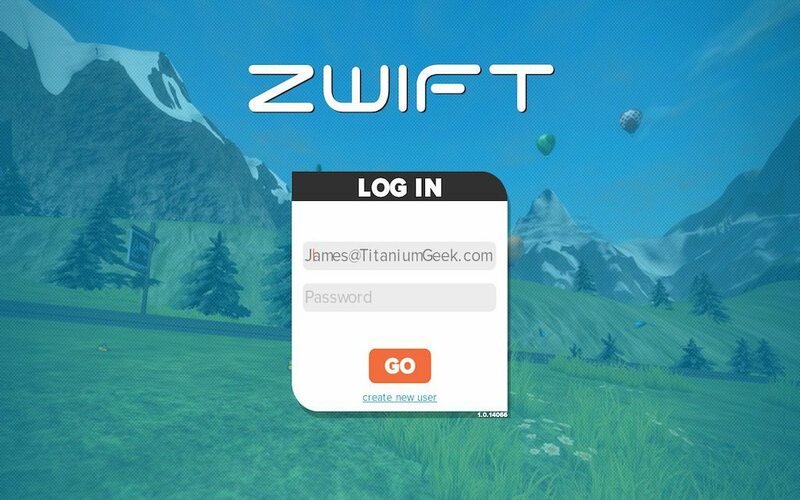 Once Zwift has booted it’s time to LOG IN! 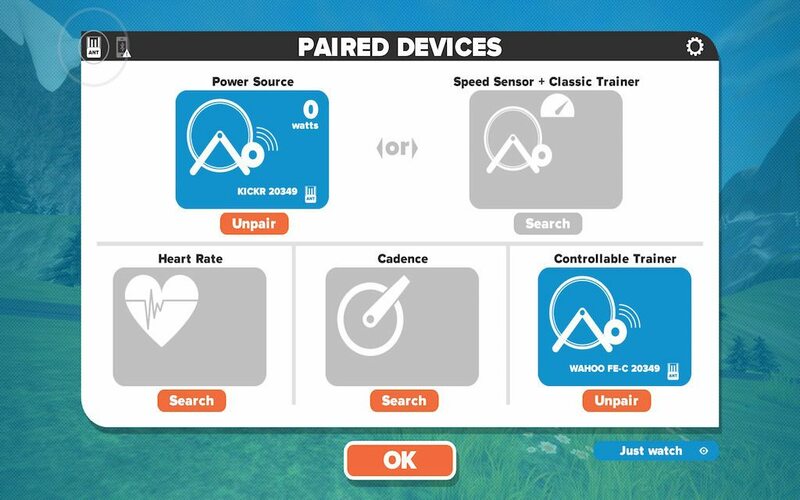 Immediately after logging into Zwift you are presented with the Paired Devices screen. 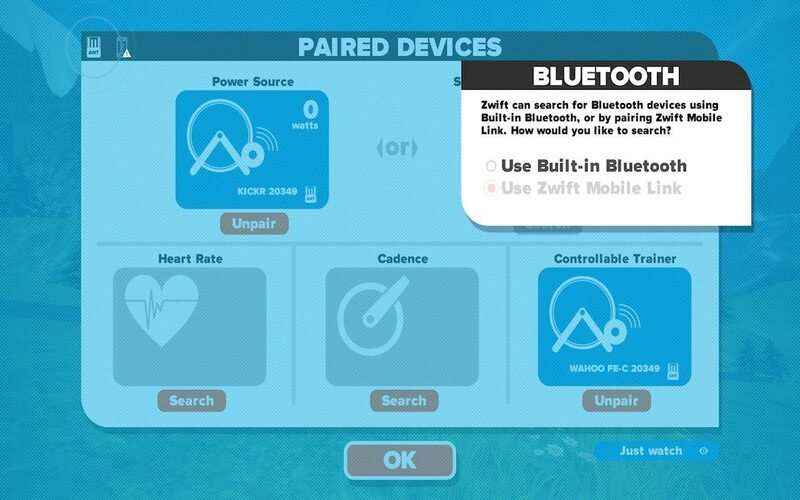 This will pop up every time you log in, to confirm your kit is working, and you have the right bits connected. 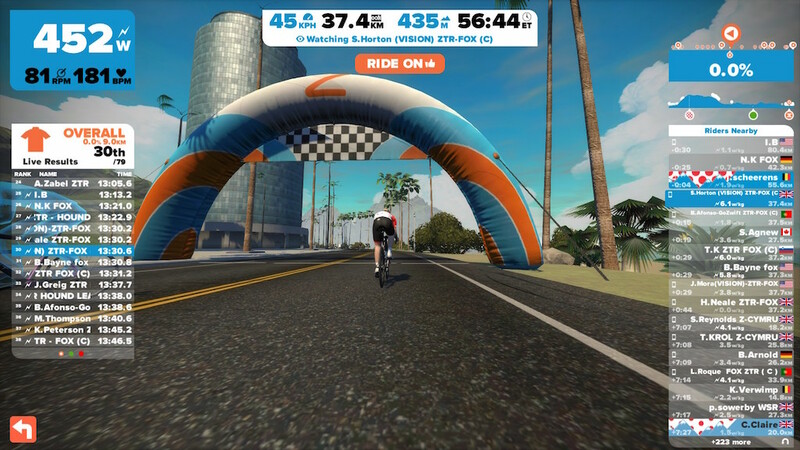 Once you have logged in for the first time, Zwift can auto pair your devices, after which, the Paired Devices window will auto-close after 5 seconds – making login more efficient when you have everything set up. 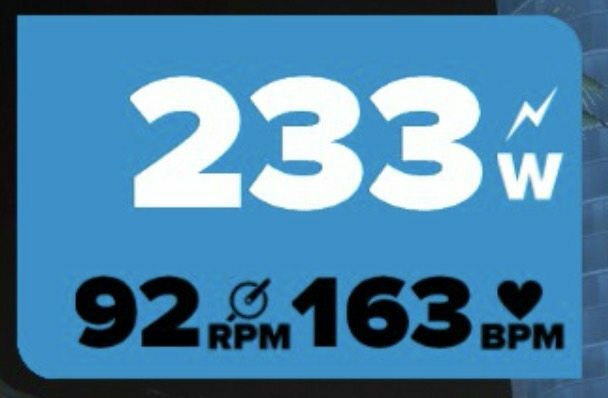 One issue that people have raised about power meters built into turbos is that while they may give a consistent readout for your power, they may give a slightly differently output from say your crank or pedal power meter. 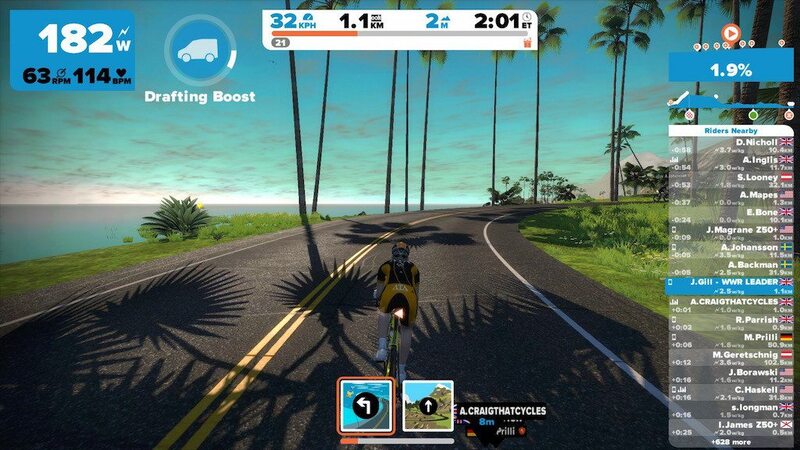 That is assuming you are lucky enough to have a separate power meter use on your bike IRL (In Real Life)! 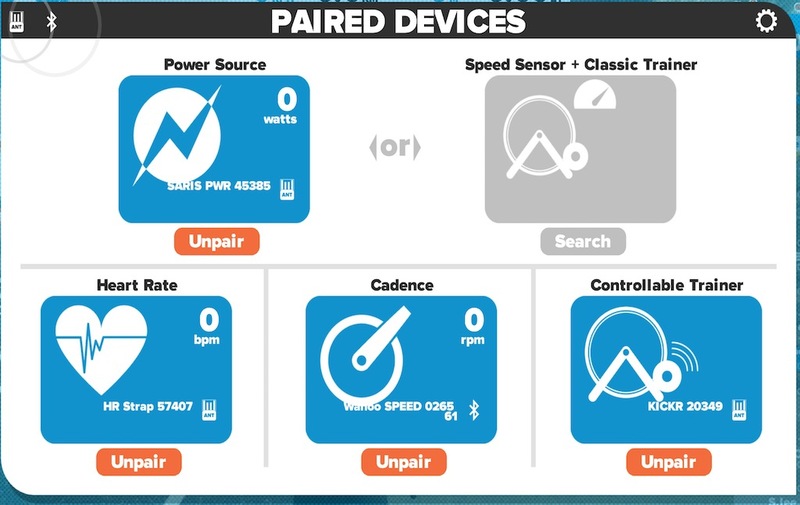 Here you can see I’ve selected the Wahoo KICKR as my turbo, but that I have selected a different power meter – my Garmin Vector 2 pedals, as the power data source Zwift will use. 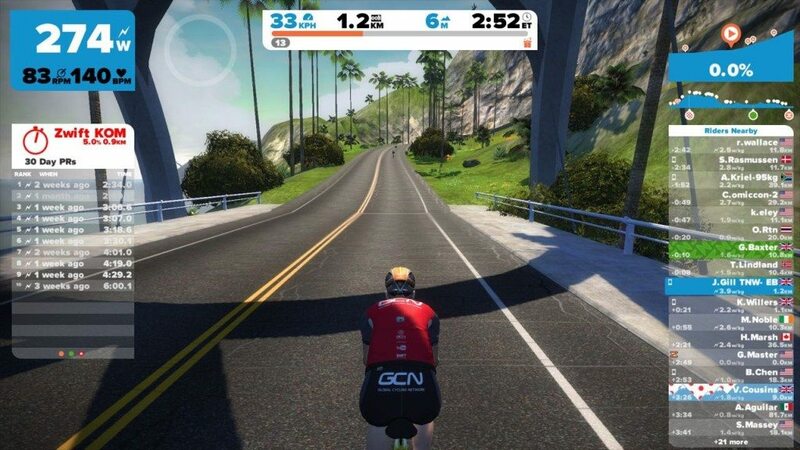 The main benefit of this is that it allows me to use the same power meter when I’m on Zwift as I’ll be using when out on the road. zPower: which is less responsive during sprints as it does not account for acceleration – or to be read another way, can be a little choppy! 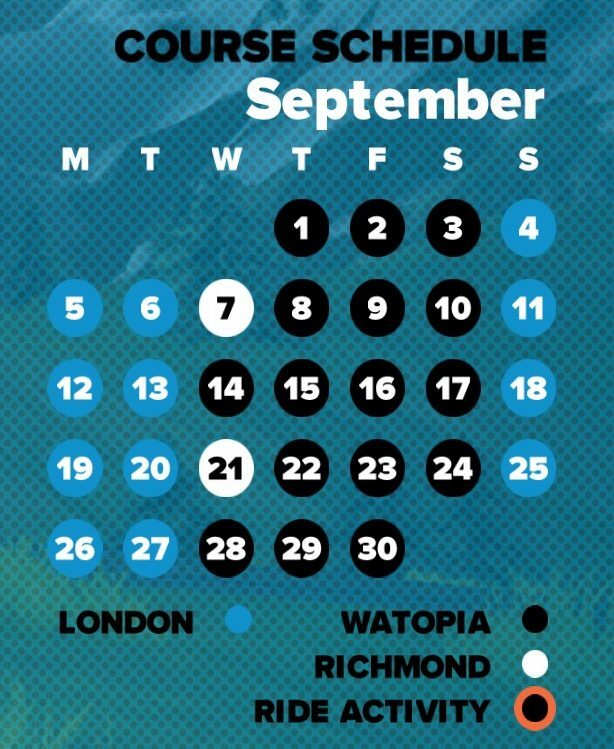 Are you here for an event? Do you want to Ride or Workout (train)? Which type of route would you prefer? 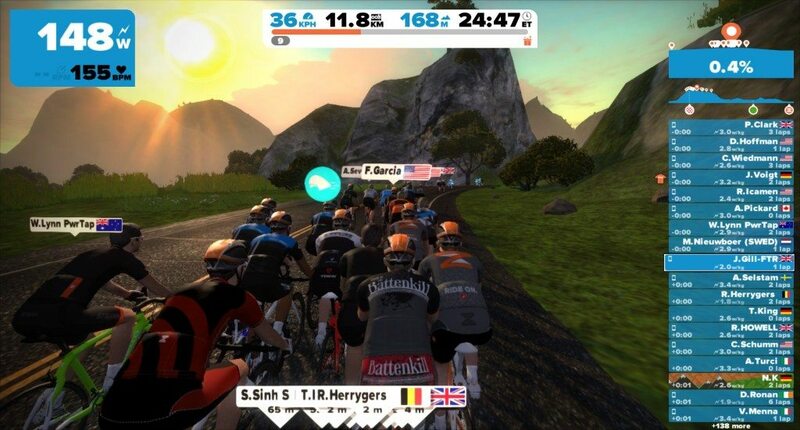 Would you like to ride with a particular rider already on the course? 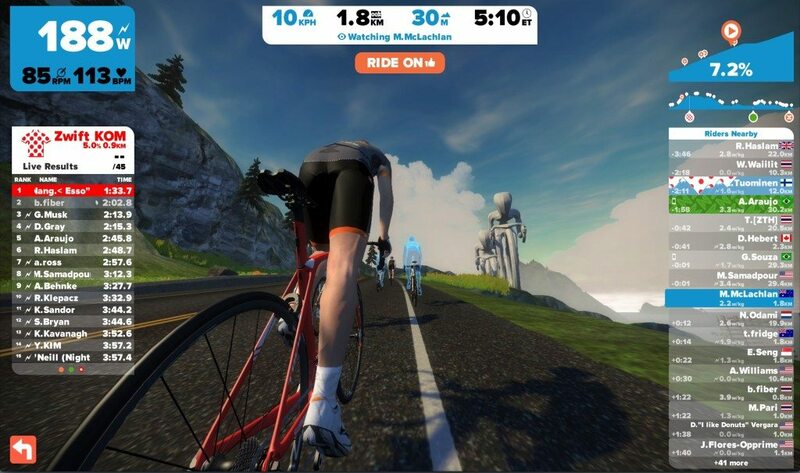 Let’s walk around the start screen first, answering Zwift’s questions as we go. Underneath is how you performed against your previous goal – I think it’s fair to say I didn’t cover myself with glory last week! Returning to the centre panel, the question is: Do you want to Ride or Workout (train)? 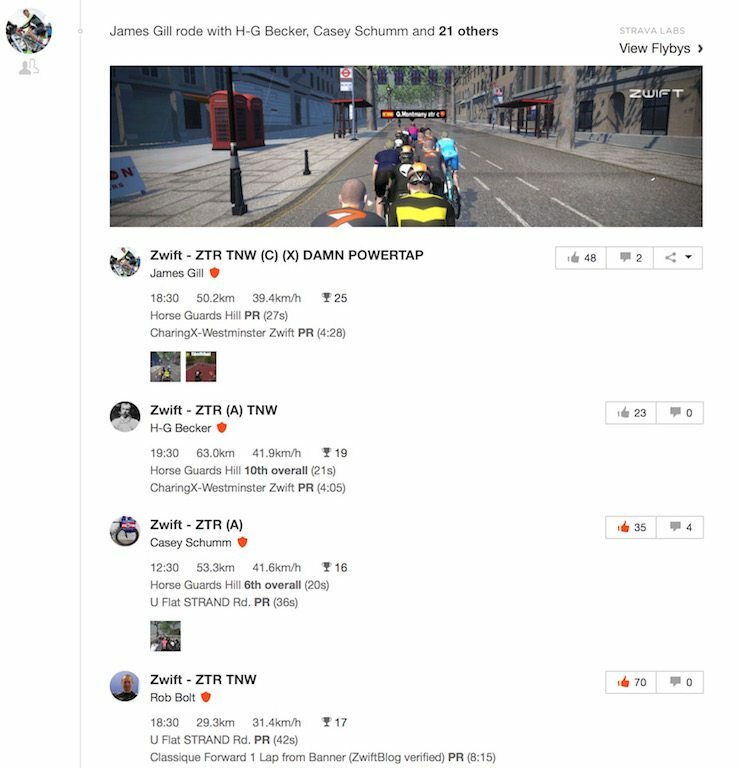 For now, let’s assume you are completely new to Zwift and just want to go for a spin, that brings us to the next question! 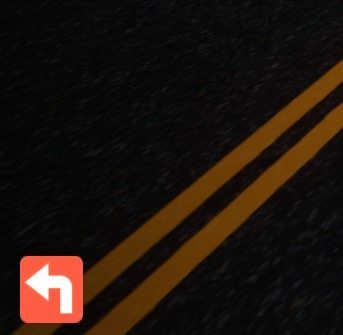 : Which type of route would you prefer? 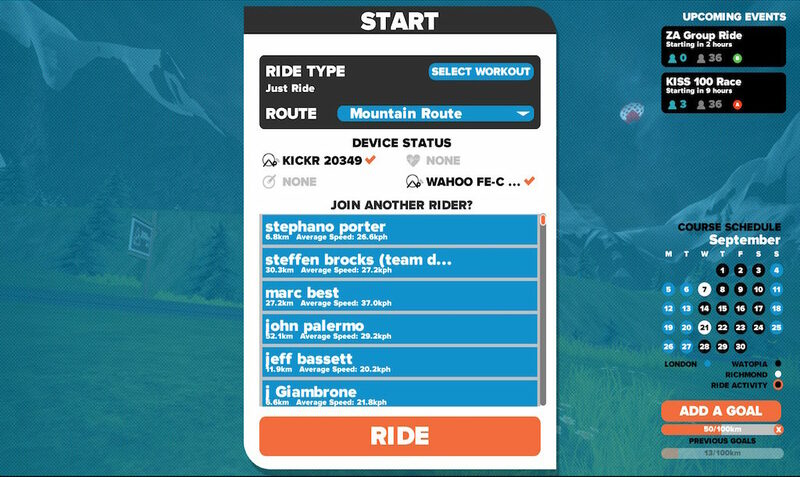 By hitting the arrow next to “Route” it brings up a menu to select which courses are available on Watopia – here’s a tip for the first time rider – don’t try the Mountain 8 first, that’s a LONG climb to the top! 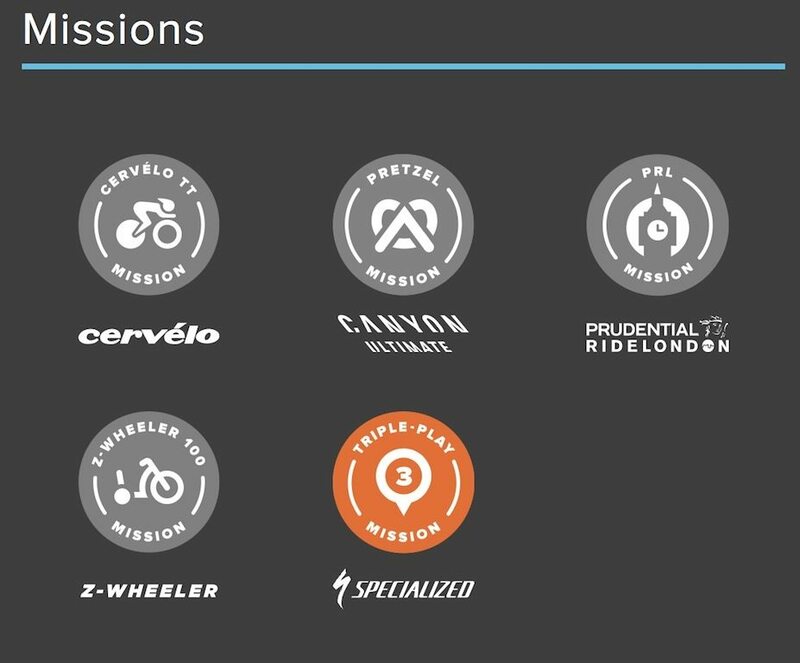 Similarly if you: Would like to ride with a particular rider already on the course? 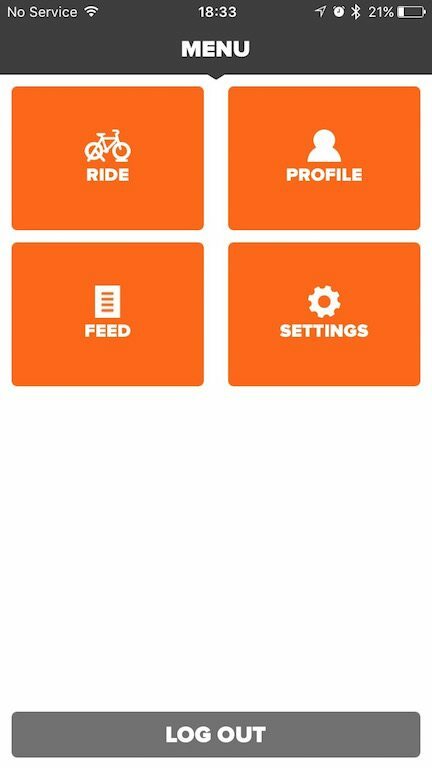 Select their name on the carousel and once you have selected your route or rider, hit the orange “RIDE” button to get straight to the action! 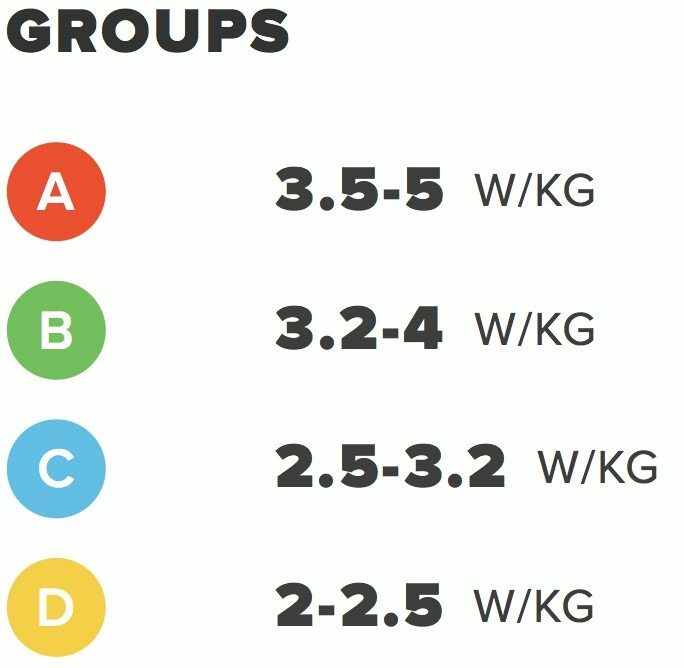 So before we look at the game, it’s worthwhile going over your settings, to make sure if nothing else, your weight is correct – as that matters in the game. 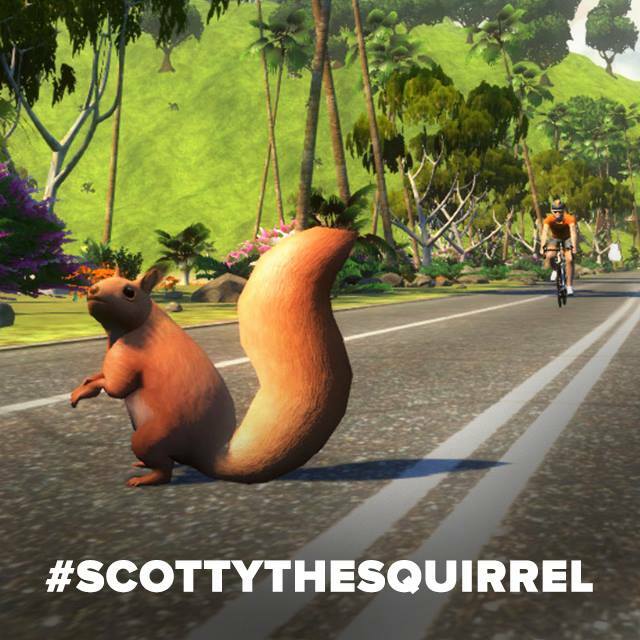 When you log into Watopia, you will appear on a stretch of road, just before the main town. A big question is does rider weight matter other than aesthetics? Short answer yes. 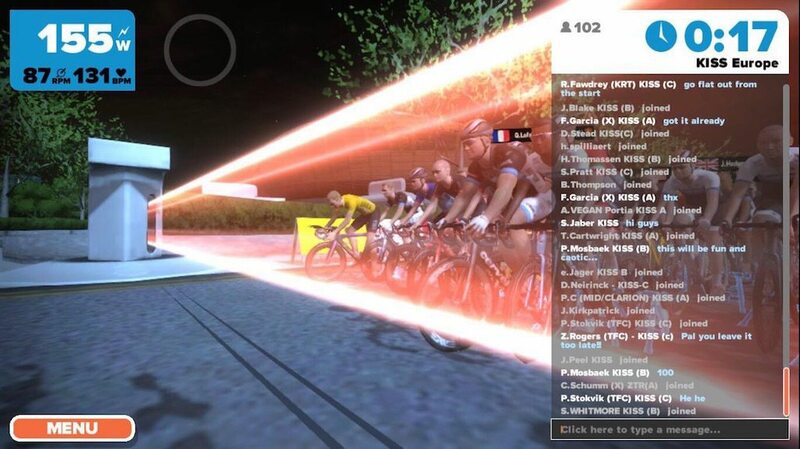 There is essentially a speed advantage to being lighter, a 3.5% time penalty per 10kg!. There is also a disadvantage to being taller – kind of makes sense, as that is what you see in real life – thought to be about 5 secs for every additional 10cm. 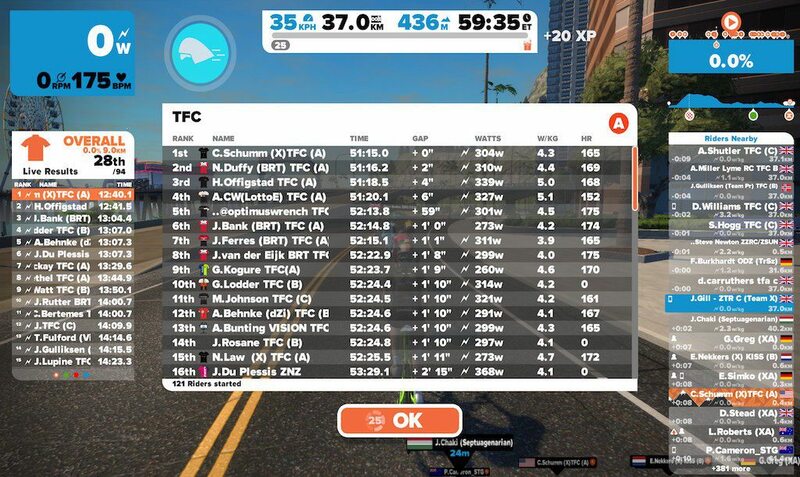 SO yes, you could cheat, and adjust your stats, but at the end of the day, Zwift is a game or a training platform, so the only person you really cheat is yourself. 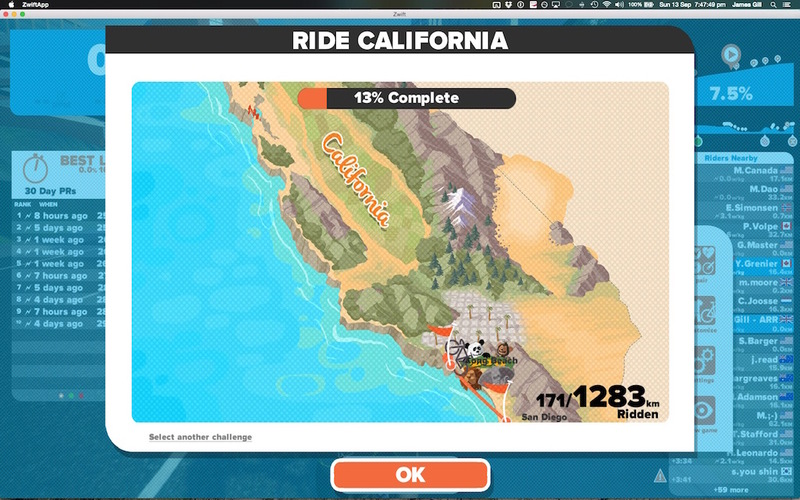 In the very middle is you Rider Score – on the “pause screen” is the only place you can currently see your points total – referred to as the Rider Score. These points relate to your in-game level. The more points, the higher the level. The higher the level, the more toys! 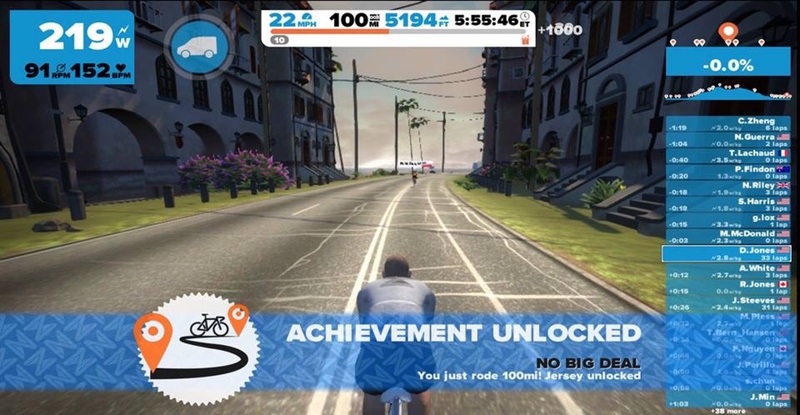 As you increase your score, you reach, and unlock presents, as can be seen above, which tend to be upgrades, such as jerseys or bikes. The upgrades and the points required are listed below in the Unlockable gear section. 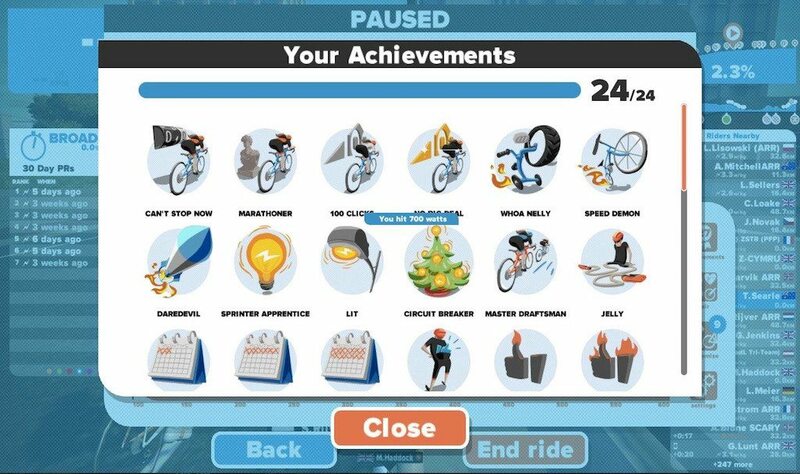 There are currently twenty-four regular achievements – You can see the requirement for each achievement by hovering your mouse over the icon in this screen. 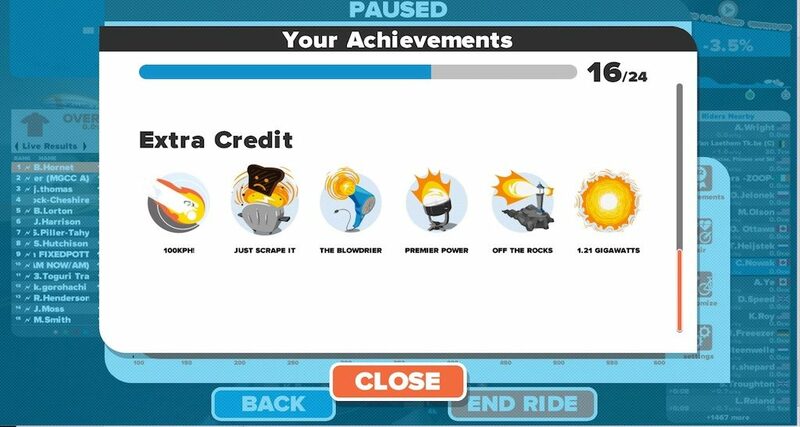 Also, there are also six “Extra Credit” achievements related to power for you to unlock. 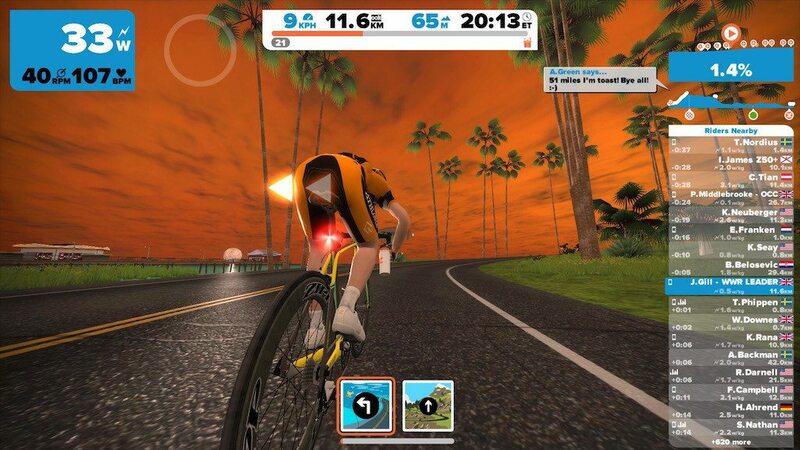 Trainer Difficulty (Smart Turbo) – affects the feel of the gradients. 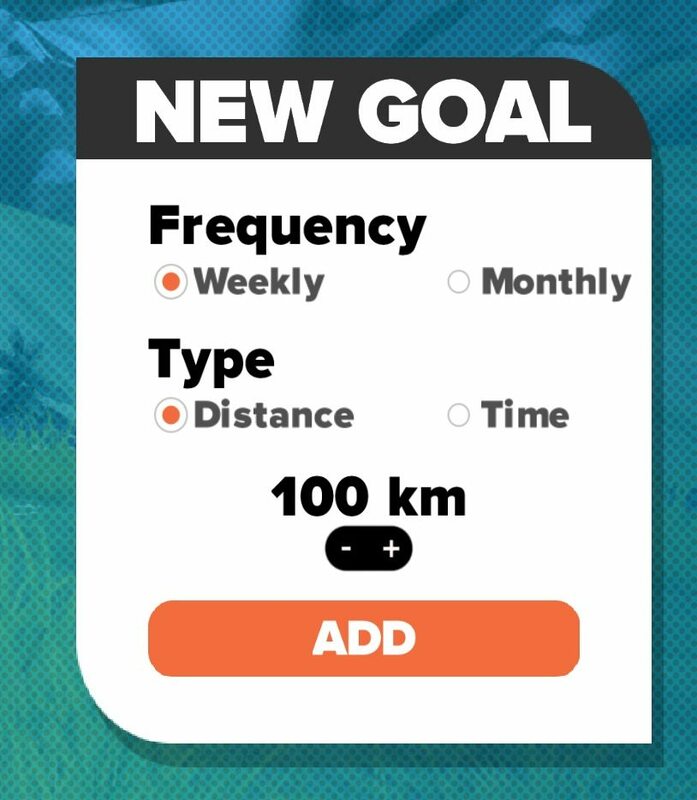 Apparently, 100% is supposed to mimic IRL completely… but the default is 50%, and after 5000km on Zwift, I’m scared to change it! 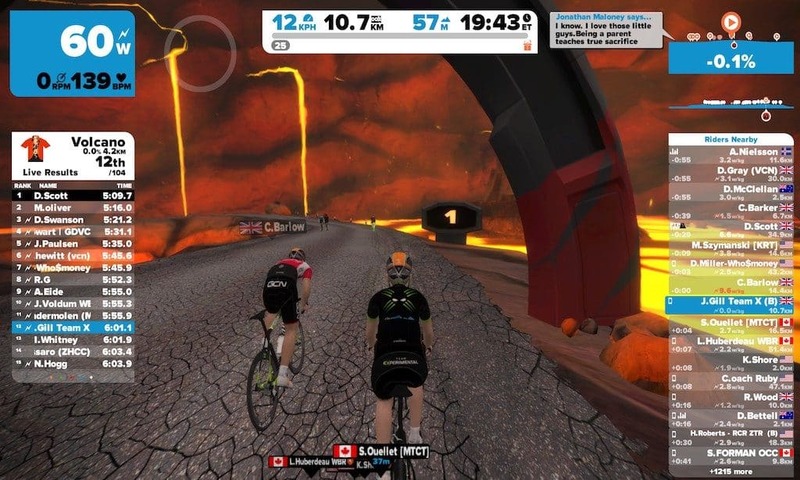 To clarify, if you do stop riding at any point on Zwift, e.g. 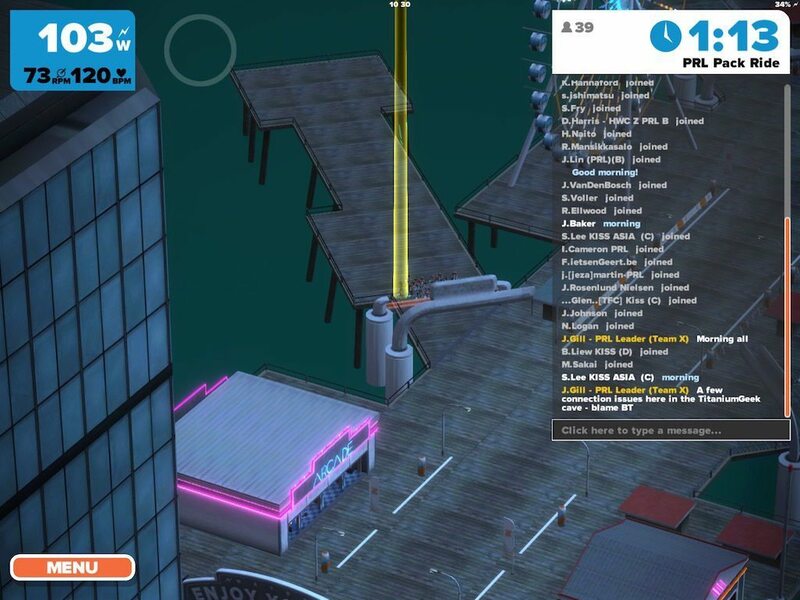 Loo break, postman, alien abduction, the ride timer will stop. 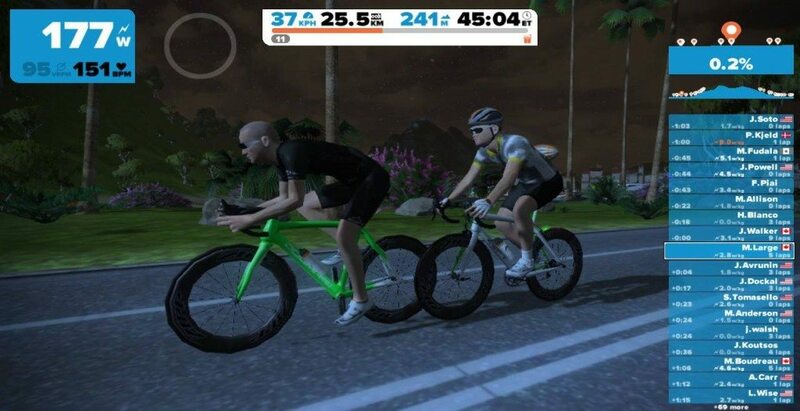 The clock and your ride will commence again when you restart pedalling. 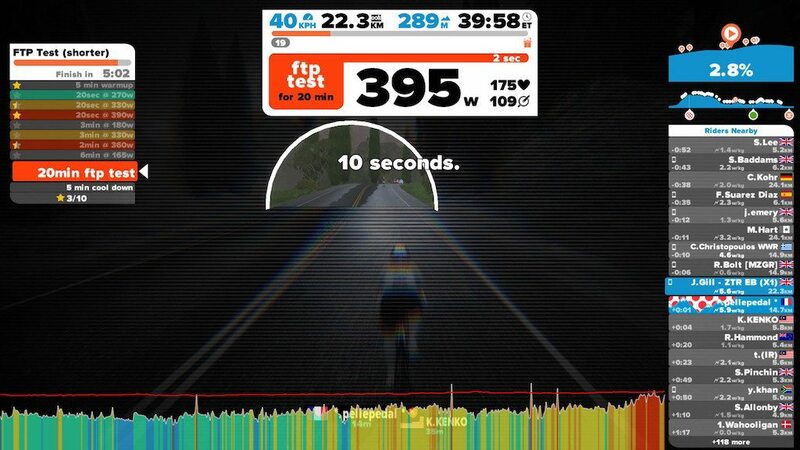 This has been tested with a 24hr pause (I’m assuming the tester was abducted mid-ride! ), as soon as you get back on, everything keeps going. Although your sensors may have gone to sleep! 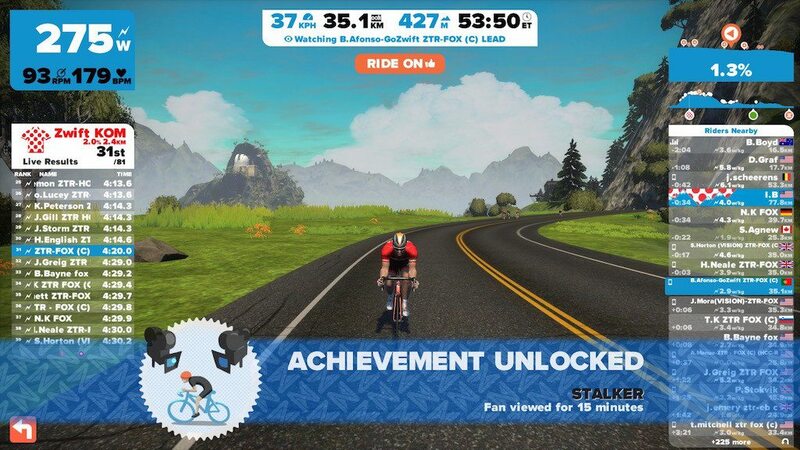 With that in mind, Zwift has Strava integration built right into the game. 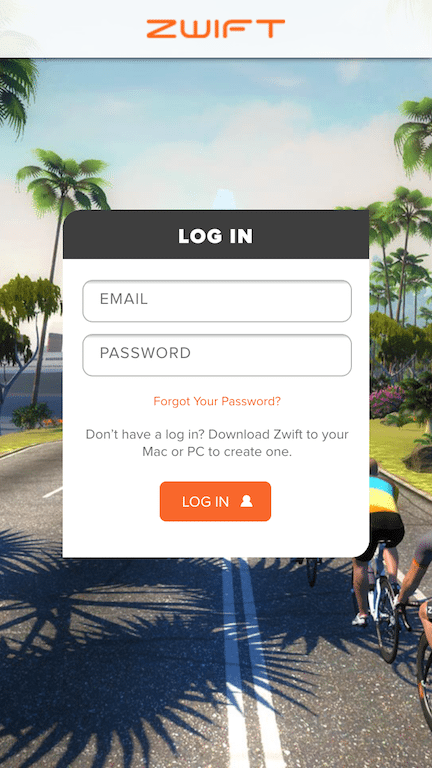 BUT you have to log into the company website www.Zwift.com to make the connection. 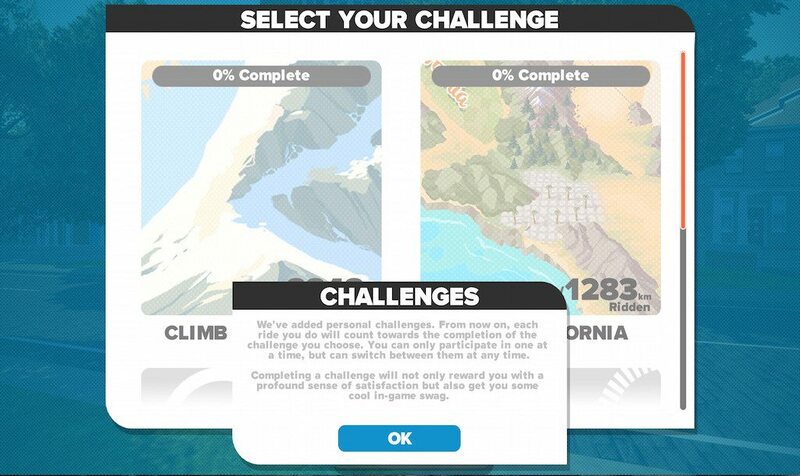 Currently, it can’t be done through the game itself. 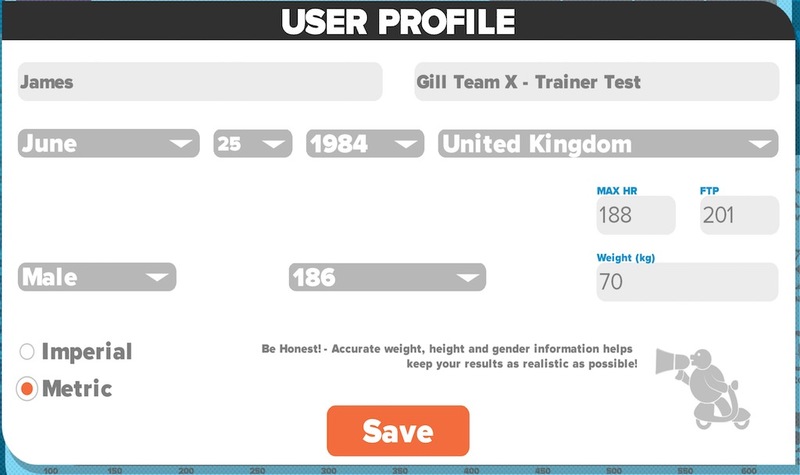 Inside your profile, there are several options about your account on the LEFT side of the screen. In the “General” tab you can also change your name etc. before a race. 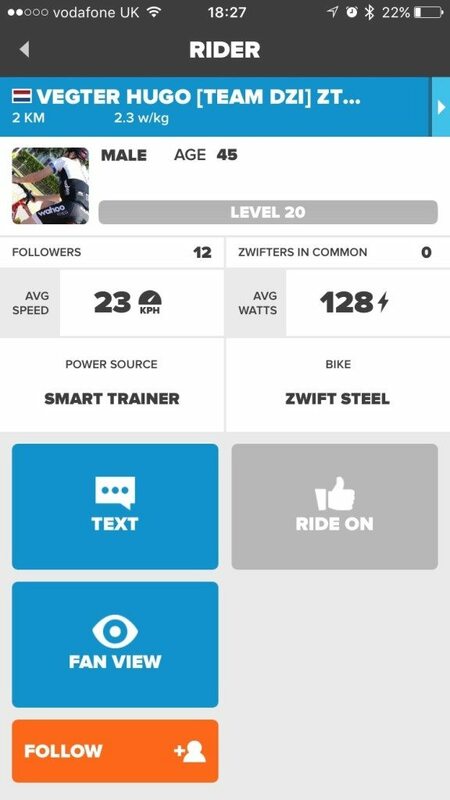 To connect to Strava, you want the “Connections” tab at the bottom. 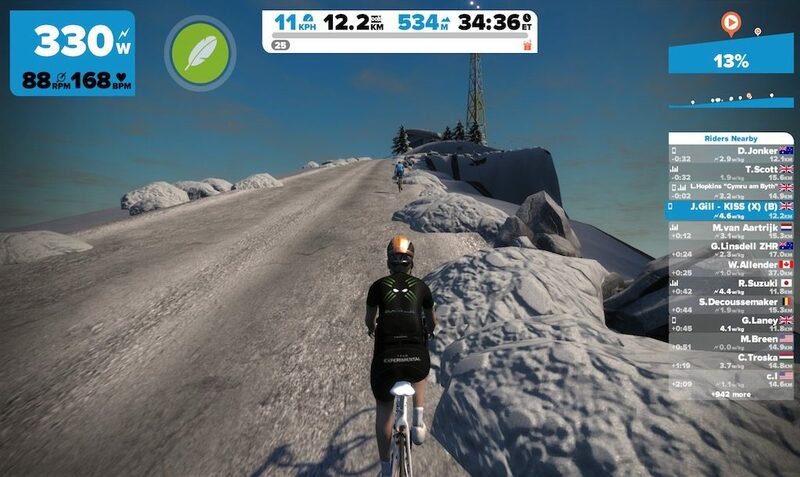 Simply follow the prompts for your Strava account to be connected, then you are quite literally ready to race. 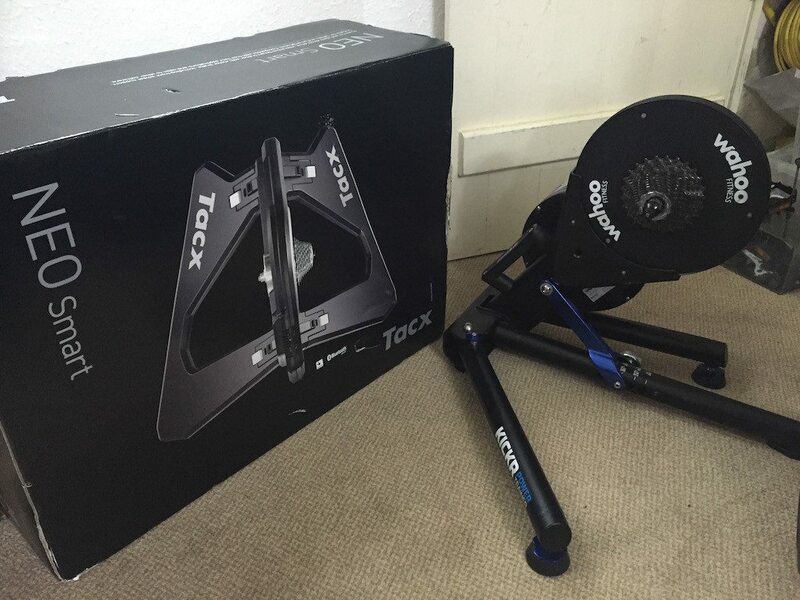 Note the promo code section – if you buy a new turbo trainer from Elite or Wahoo, then you also get one-month free use – I’m still hoping TacX will come on board with this offer! When you upload to Strava, the system can automatically replace the route map, with a picture from your ride – hopefully with you cranking out the watts! It should be noted that occasionally things happen. Cats knock over laptops; power cuts happen to trainers and simple internet gremlins. 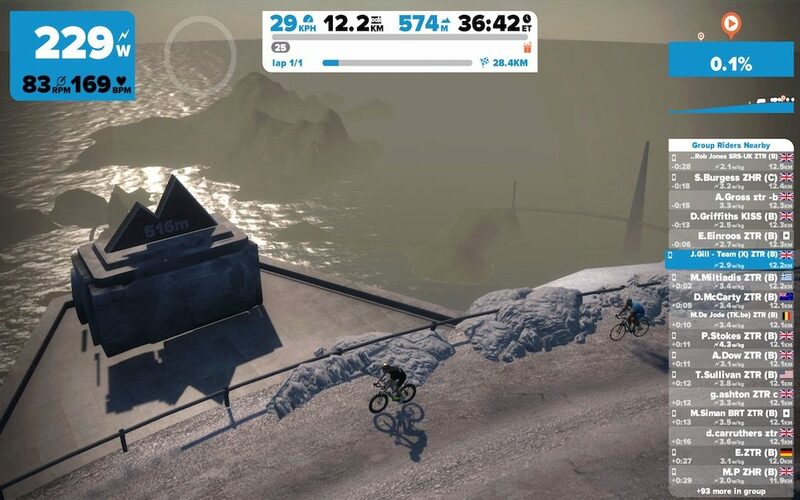 As a result, you can sometimes lose a ride before you’ve actually finished and have had the chance to save the session. Don’t worry. 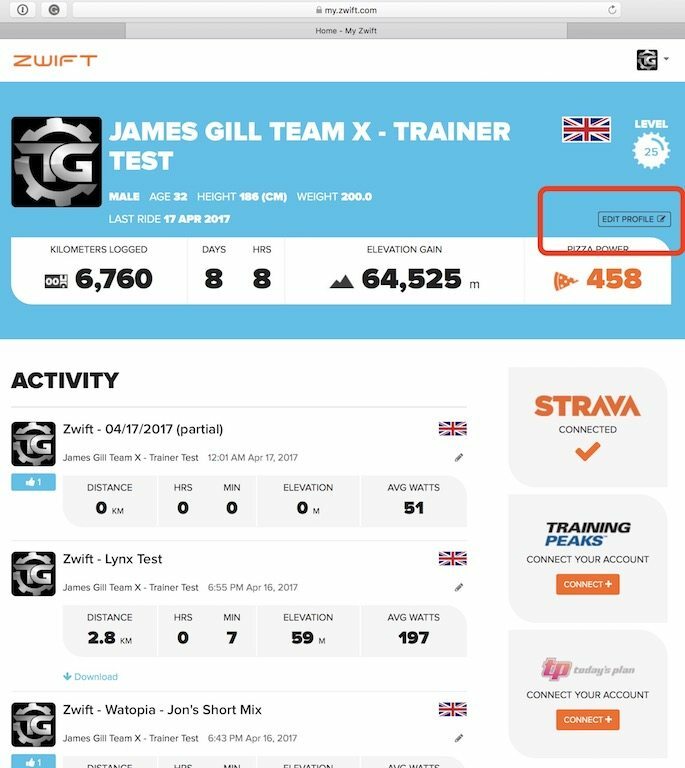 Your effort is not completely lost – you can still get access to the .fit file generated by your ride and manually upload it to Strava. 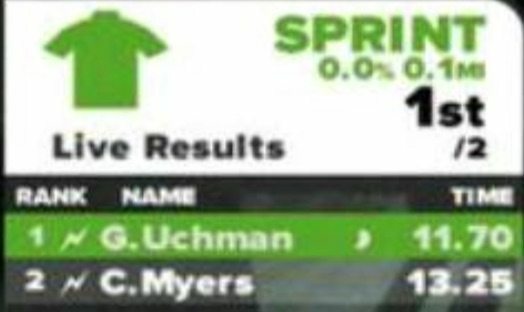 Proving that you did dominate that KOM! 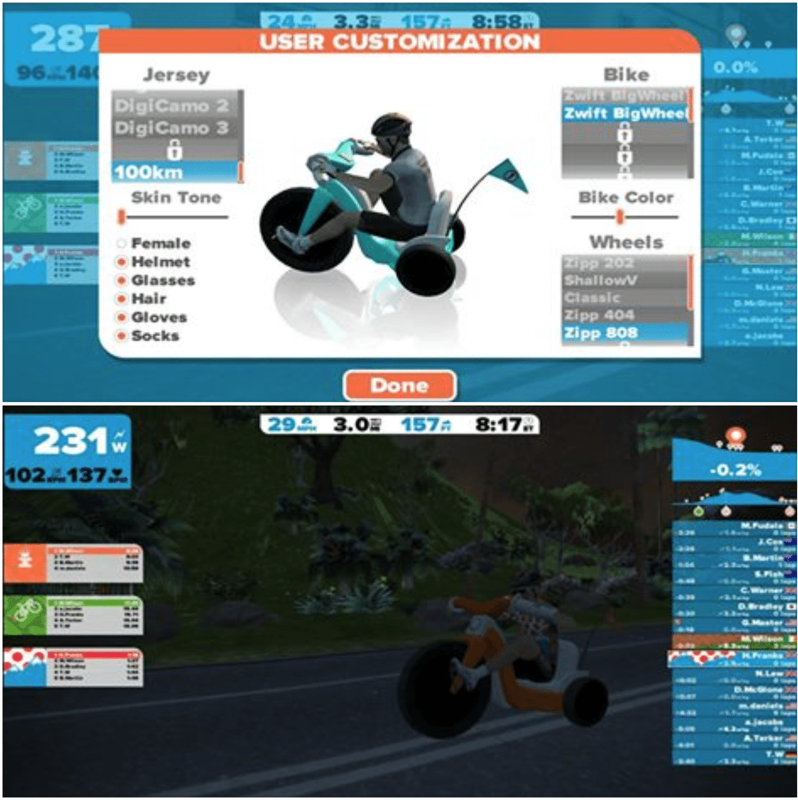 To find the .Fit files look in your Documents/Zwift/Activities folder on your computer, and you’ll find all the. 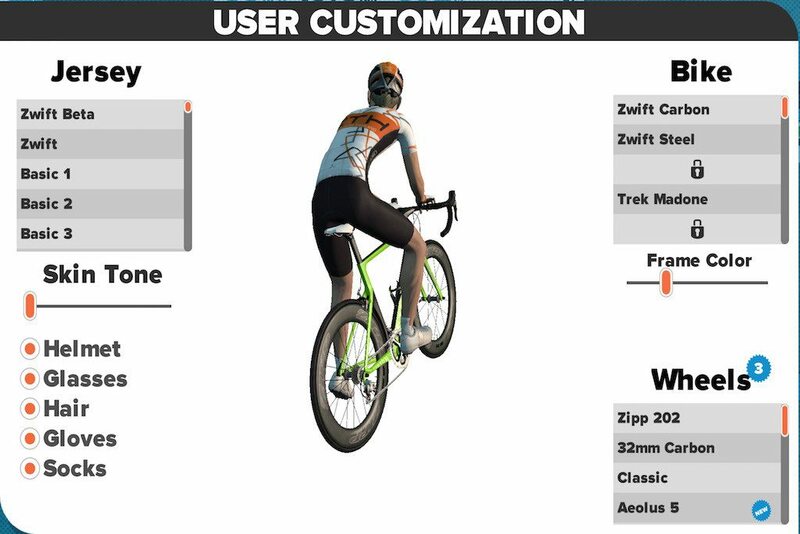 fit files you’ve ever generated on Zwift. You can find the one with the appropriate time and date. 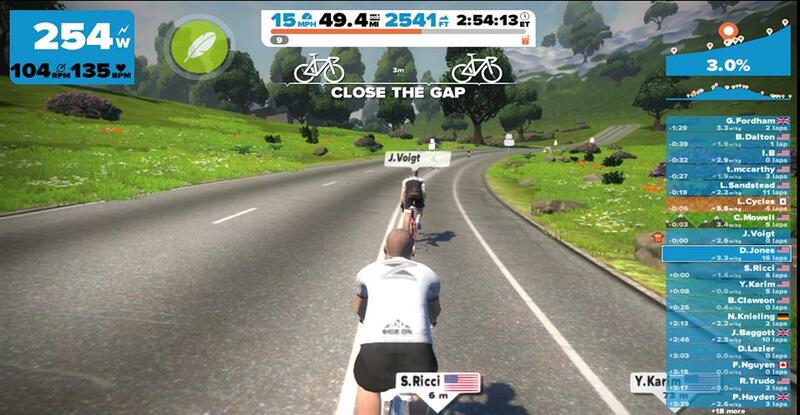 Save this, and manually upload through the Strava website. Sorted! 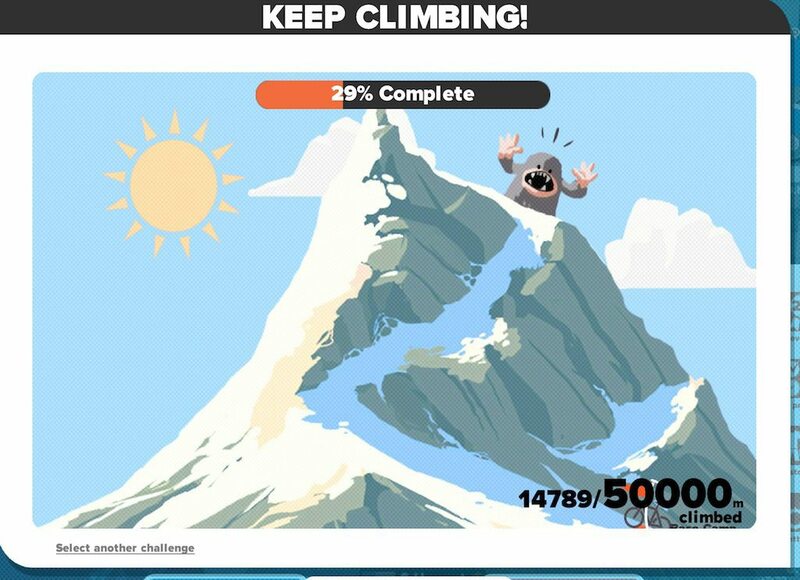 Climb Mt. 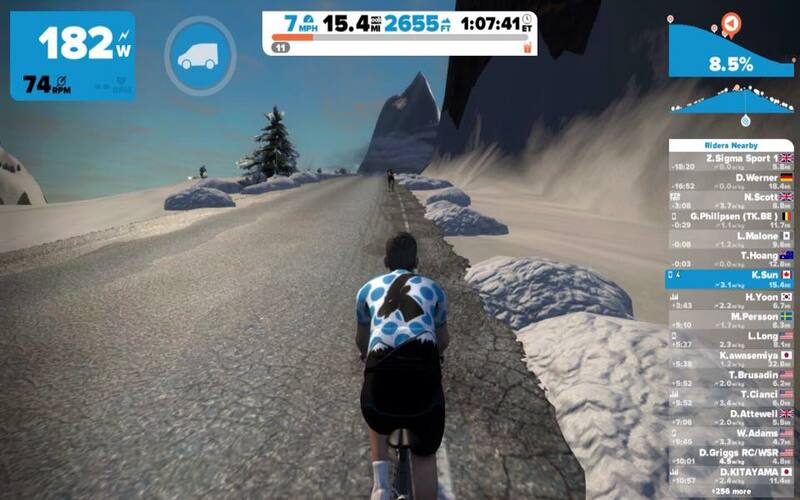 Everest – after the lunatics such as Frank Garcia started doing the Virtual Everest challenge using the Zwift system, Zwift went and made it an official part of the game. 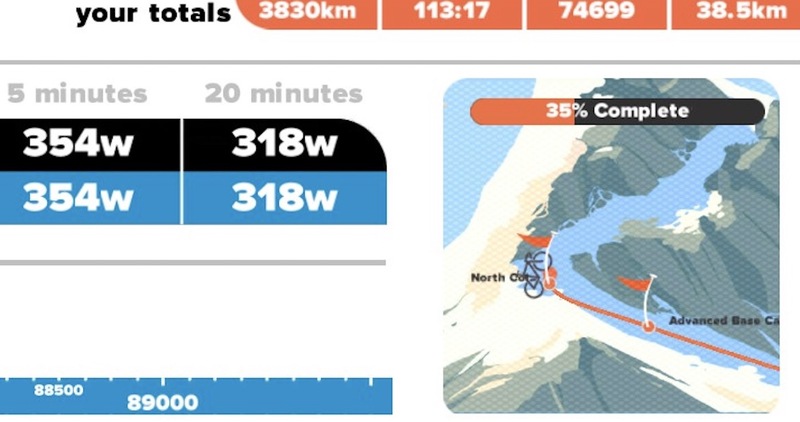 Official Everesting “simply” involves cycling to over 8,848m of elevation gain…in one go!! Yes, you are allowed breaks for food and other bodily functions, but you have to do it in one period without going to sleep. 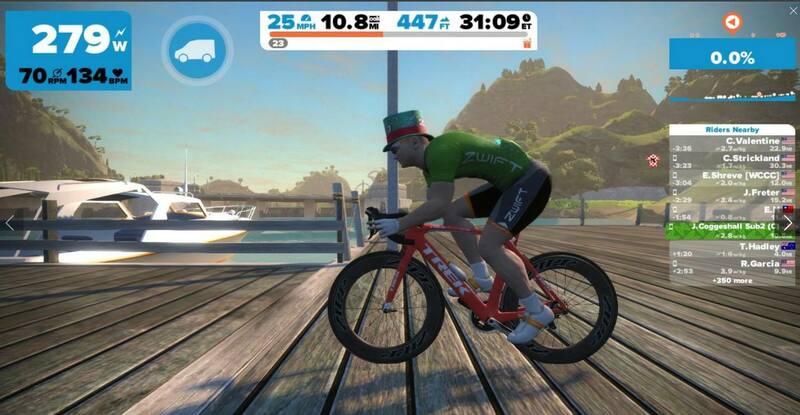 Thankfully the Zwift challenge is a cumulative total across your rides, not in one go – phew! 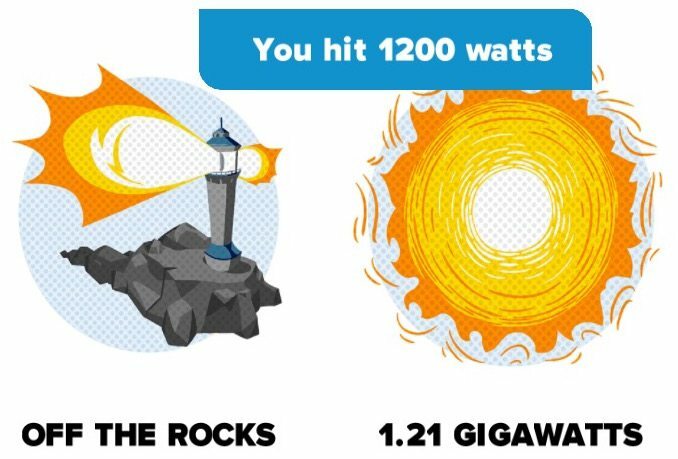 The large number at the top outlines your wattage or power output. 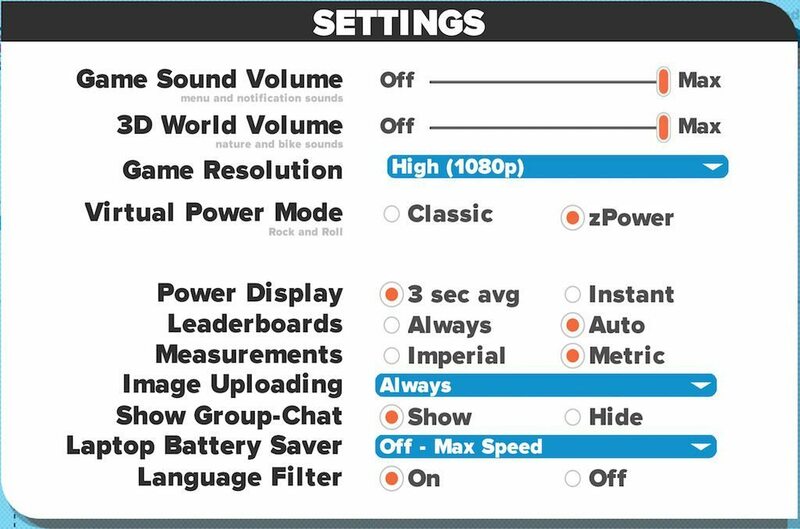 One of the more/less important pieces of the HUD. 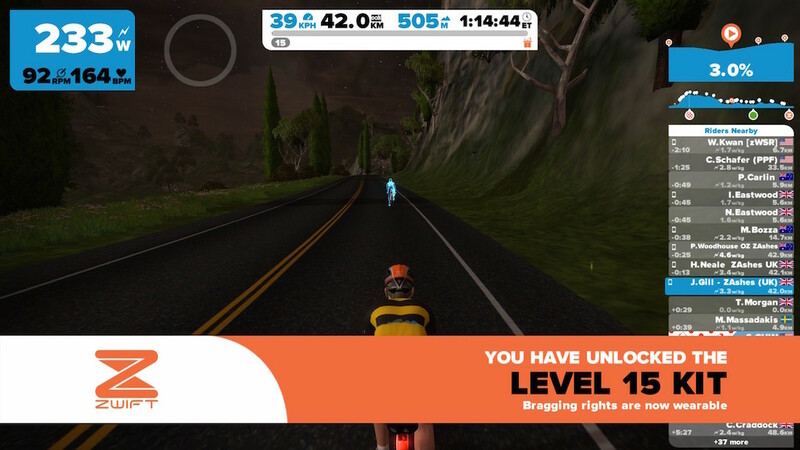 The orange bar represents how far you are away from reaching your next level, and your unlockable. 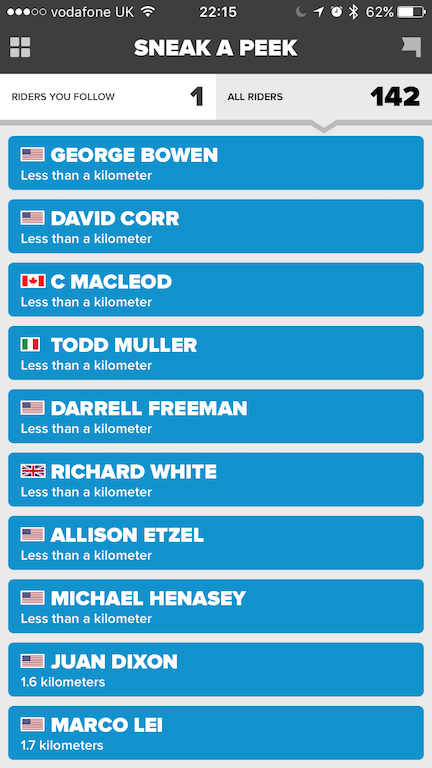 Every km/mile adds to the bar, as do some of the boosts – see below. Does exactly what is says on the tin and shows which boost is loaded. 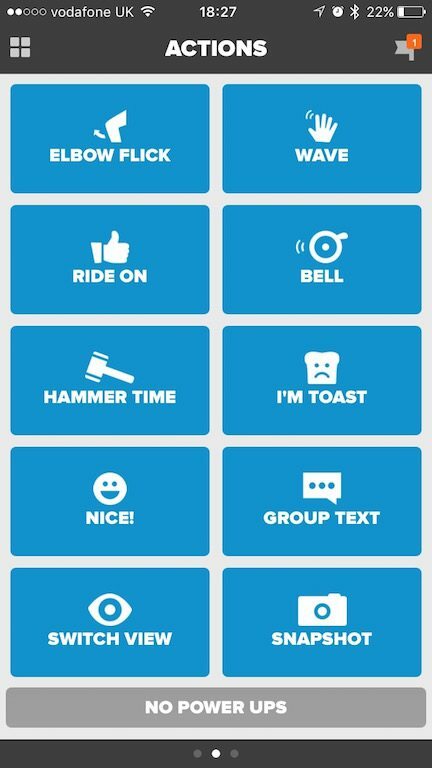 You can utilise the boost by hitting the space bar, or hitting the boost bar on the phone app! 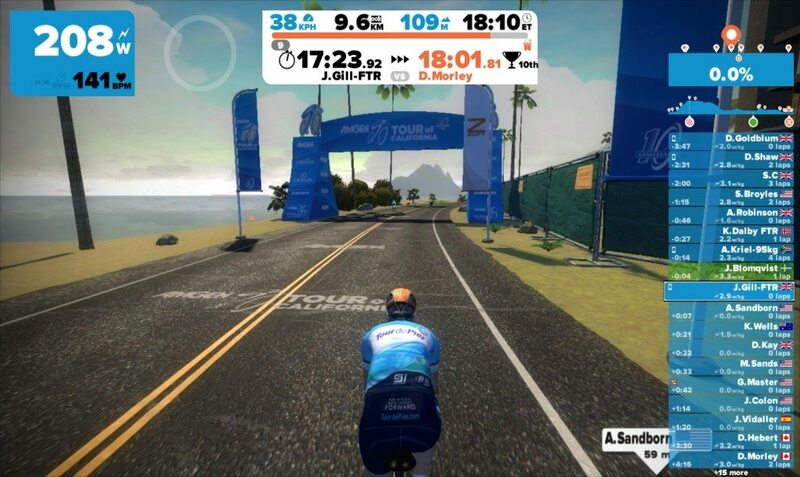 When you run over the start line for a particular challenge segment, the central box will expand to show your current time in the blue box on the LEFT, and the position you are just in front of in the orange box on the RIGHT, including that position on the leaderboard. 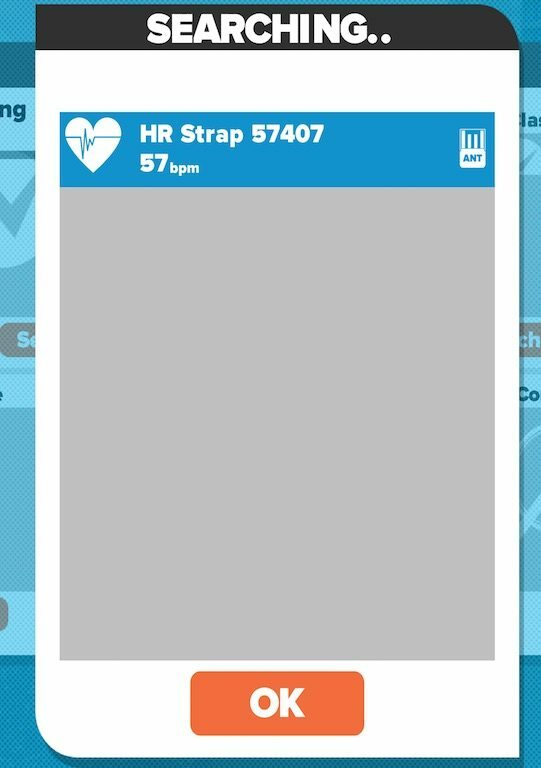 This can act as an incentive to help attack those last few sapping seconds! Underneath is the topography map of Watopia. Again you are represented by the orange dot. 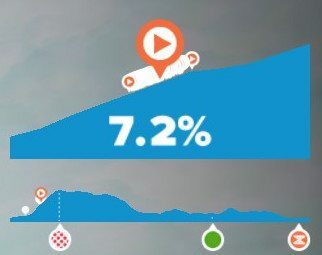 The three icons underneath the topography map show the location of the Segment/Competition banners. 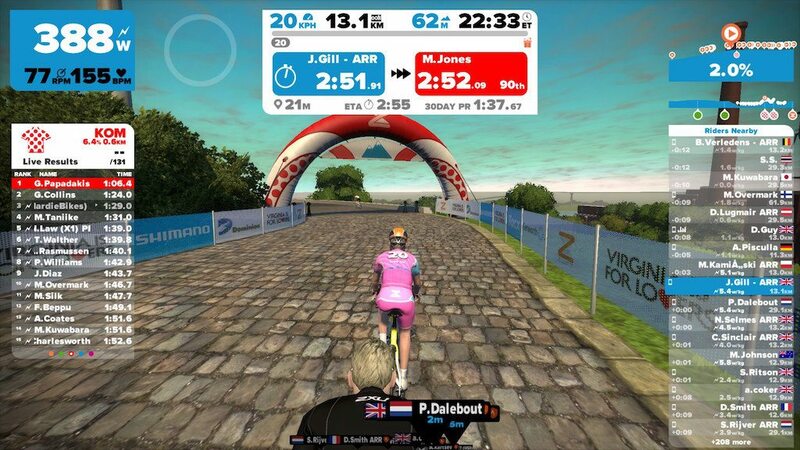 Note that the icon on the FAR LEFT is the KOM spotted jersey banner, NOT a finish line banner. 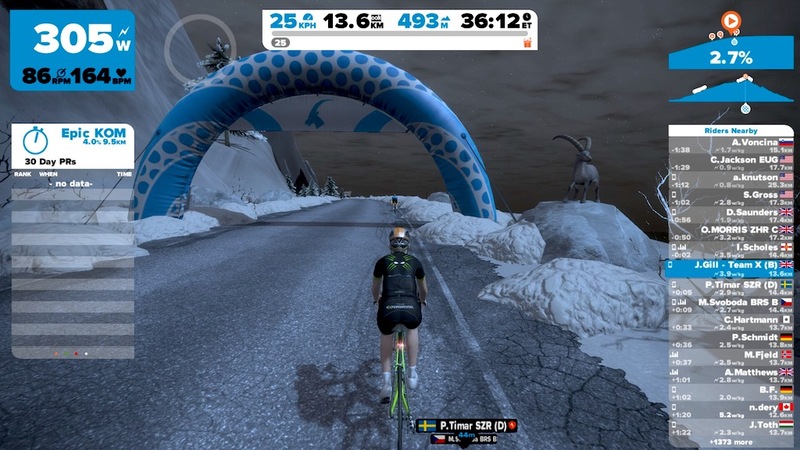 Moutain Goat – When you have completed the Mountain KOM, regardless of your time, you get a goat in your name bar, to proclaim your achievement! 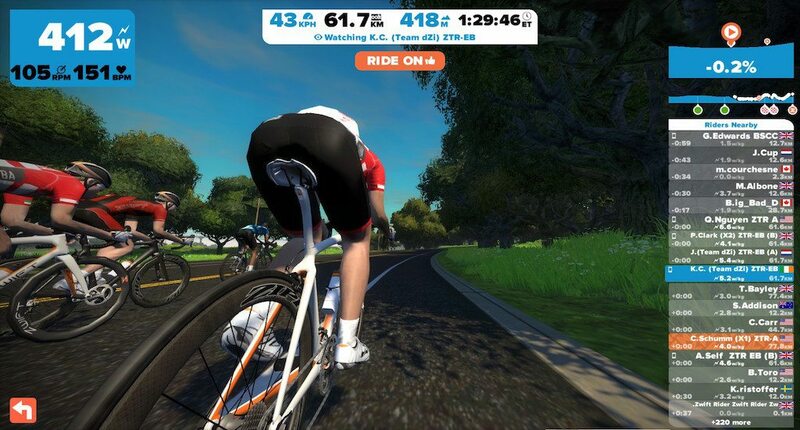 Drafting and physics matters, if you end up dropped from the peloton – it hurts getting back in – if you can! 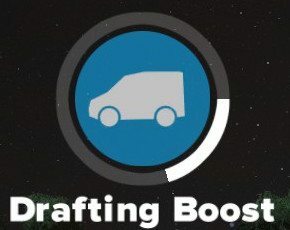 Around each boost, is a circle which activates white when you use it – the white bar counts down, showing how long the boost will last. Hitting the space bar with an empty boost slot produces the “Ride On!” Call out. 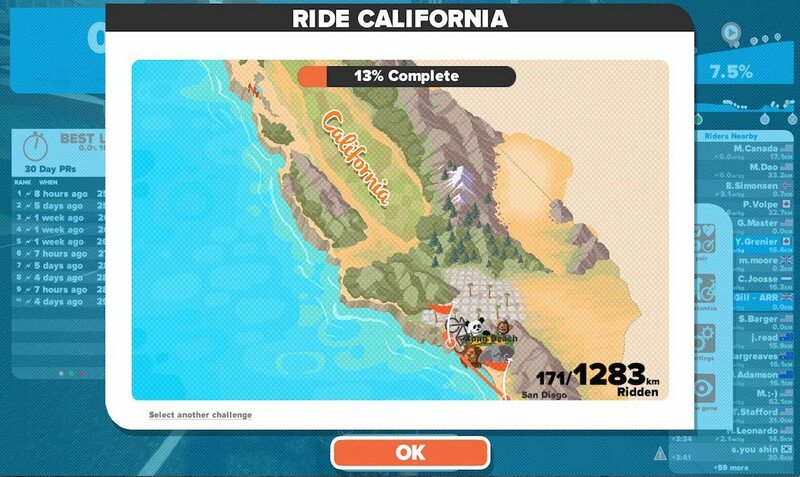 Giving 100 “Ride Ons” is also an achievement you can unlock! Some boosts are much better than others, so you can hold onto a boost passing through a checkpoint in order to use it tactically later – e.g. 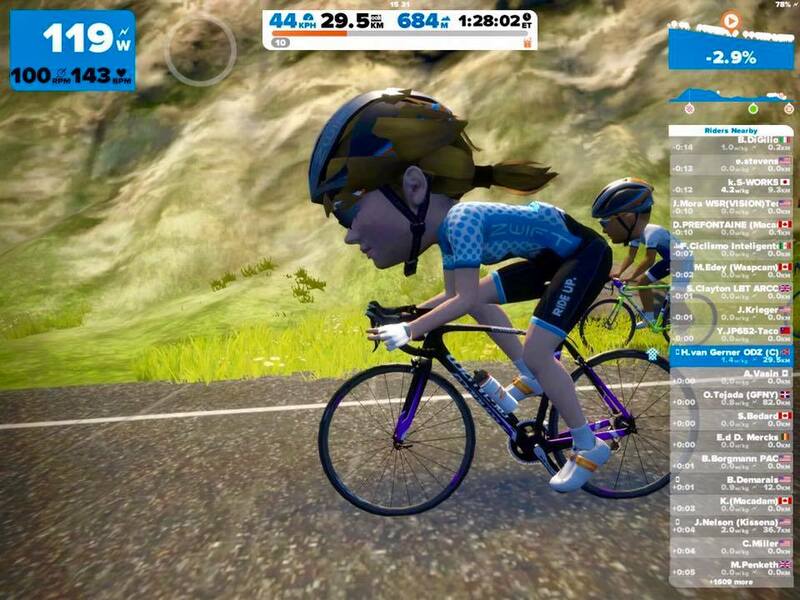 saving the feather weight for an attack on the KOM, but you do run the risk of missing out on the large or small bonus boosts. How do you get into the draft? The closer you get to the rider, the more wind they block. 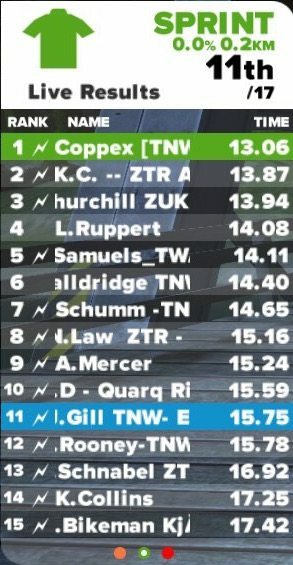 Drafting is very important for Zwift races, and as if in the real world, if you get dropped, it hurts getting back into the draft. 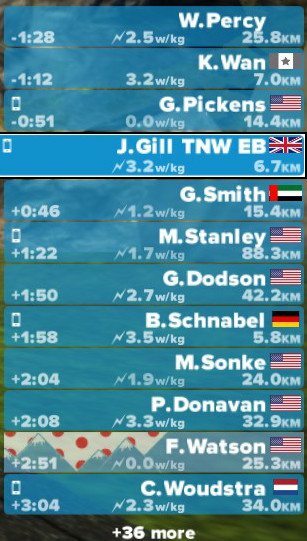 When you complete the segment, the leader board rotates back to your personal times on the segment. 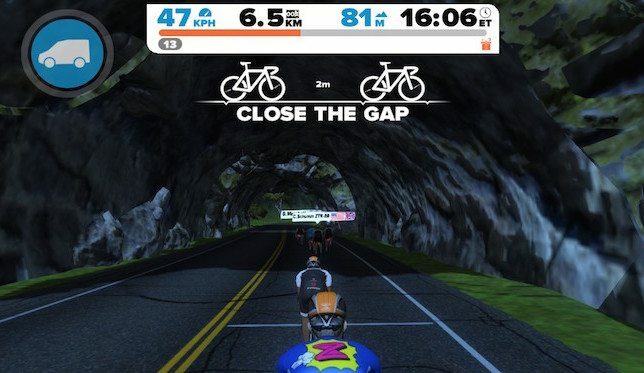 At the bottom of the leader board, are three buttons, these allow you to move between the Sprint, KOM, and Fastest Lap leader boards as you want to. 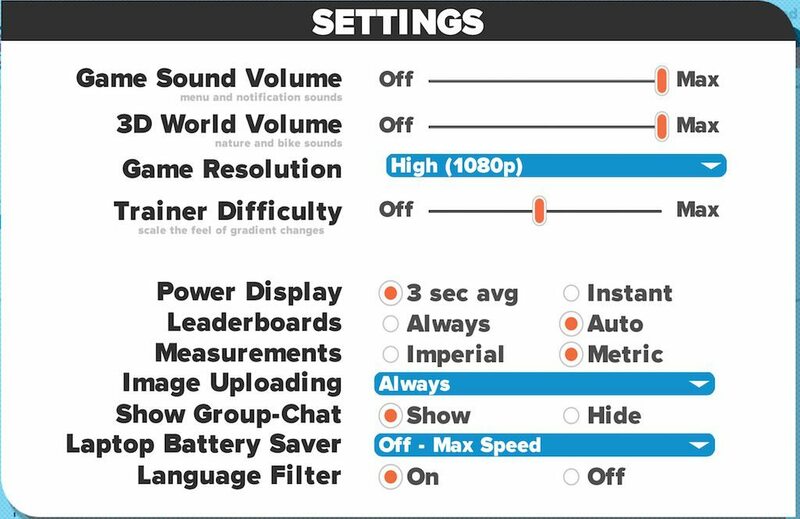 This is more often used in Spectator mode. 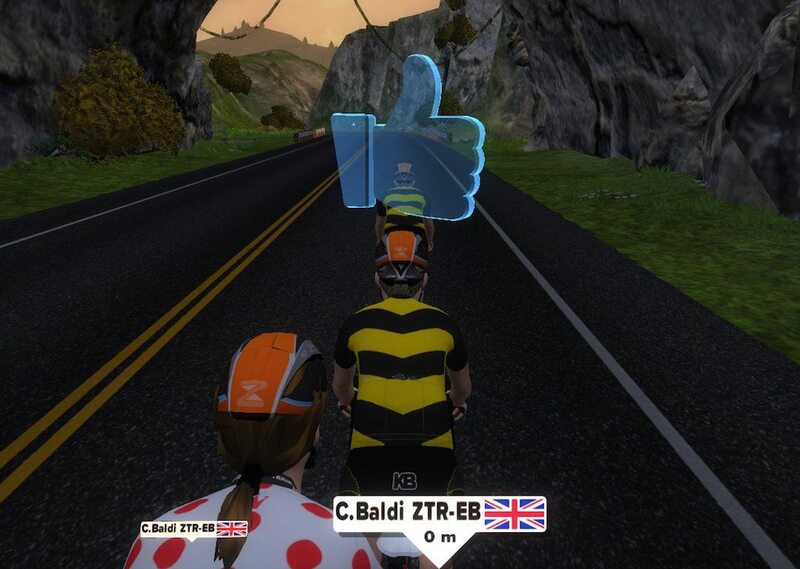 When you do, a 3d glowing thumb appears above the rider, with the RIDE OUT call out played. The thumb then shrinks and disappears in the riders rear jersey pocket – very cool! 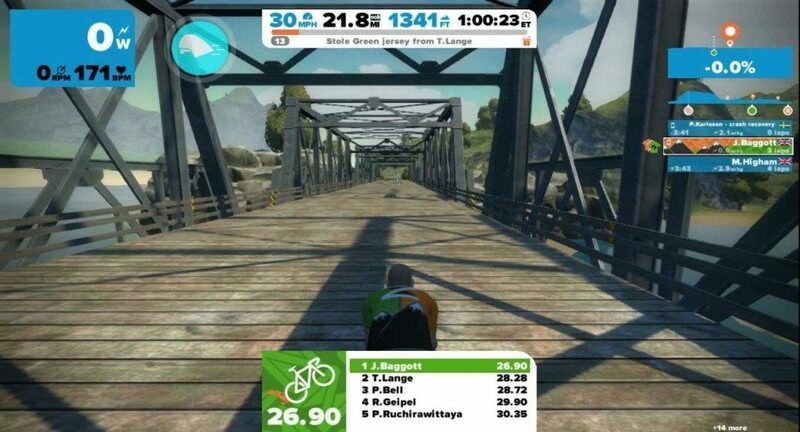 As you cross the segment start line, the centre box changes. 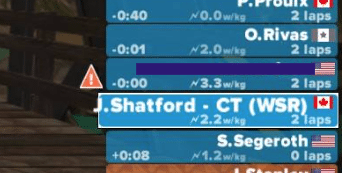 To show your current time on the segment, the distance from the checkpoint banner in the bottom left, and your 30 day personal record in the bottom. 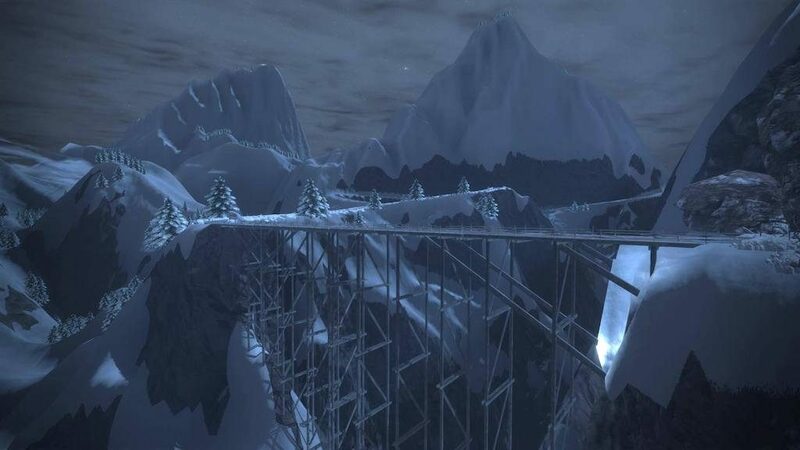 On each track there are three challenges. 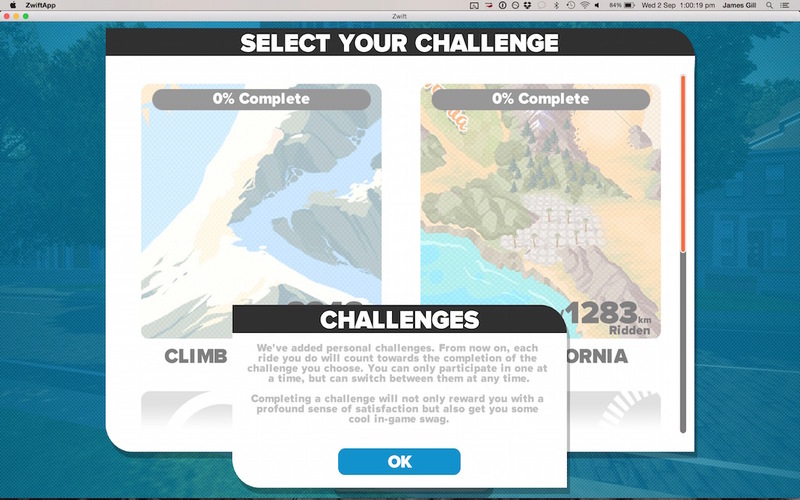 On Watopia island, as you can change direction, there are three challenge sections in each direction, so giving six possible wins, and six corresponding jerseys to win. 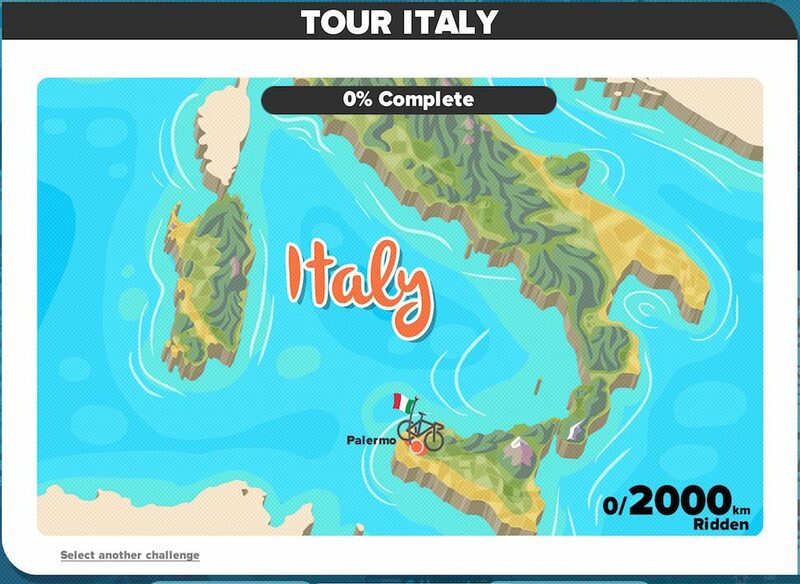 You now also get confetti, as you pass over the segment line, just to reinforce the point! 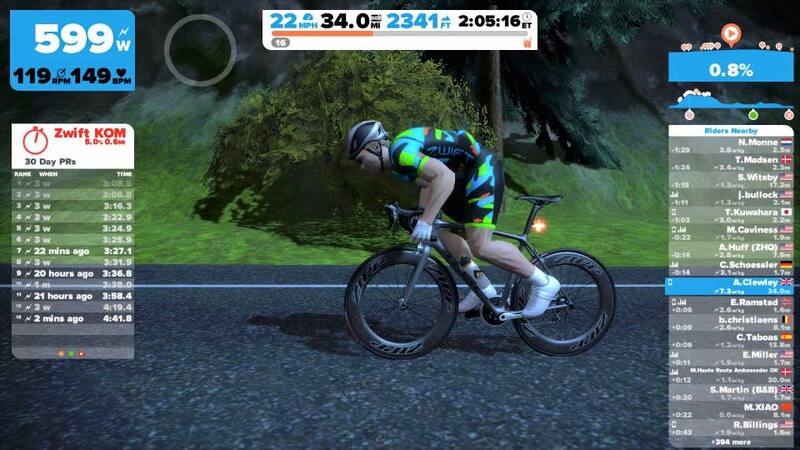 If you cross the line and unlock a segment jersey you also get fireworks too! !- But what are the segment jerseys? For each direction, there are three segment challenges on Watopia, each with a corresponding themed jersey. 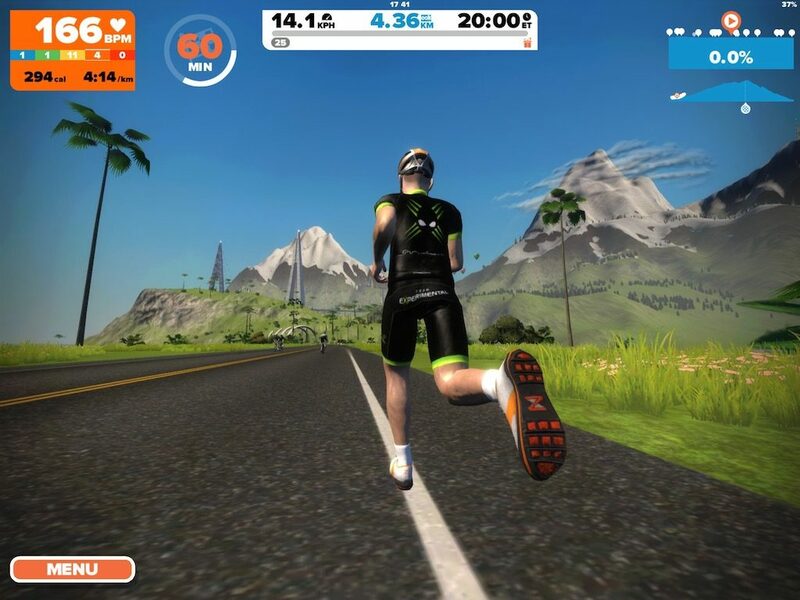 You win segment jersey by being the fastest on that section – Simples! 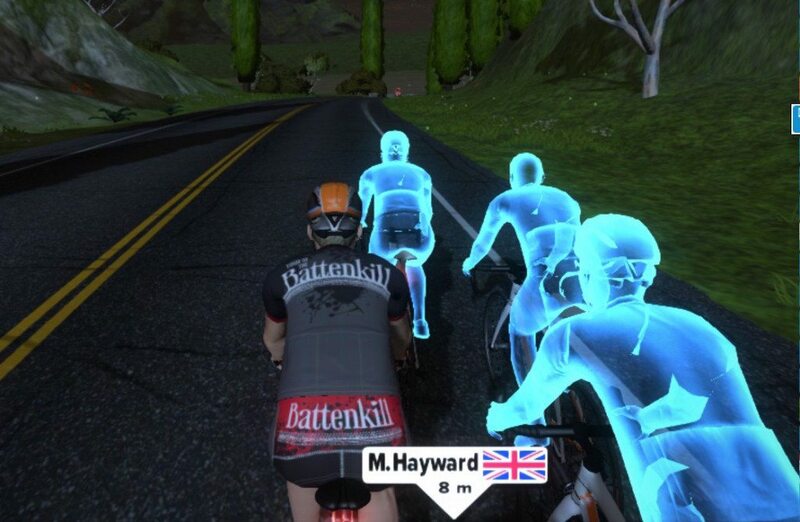 The jersey then appears on your avatar, and on the rider board on the RIGHT of the screen, you keep the jersey until someone else knocks you off that leader board OR 60mins have passed. 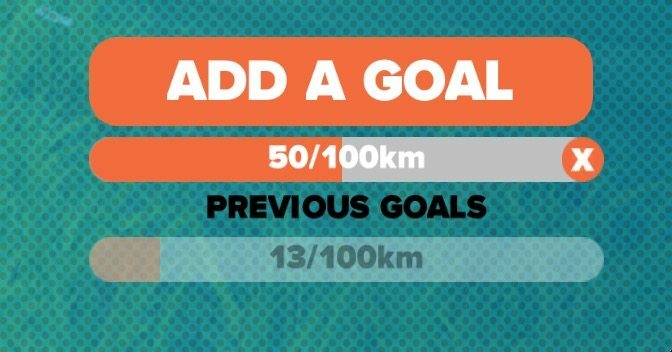 The end of each segment has 3 markers, covering the last 300, 200, 1o0n distances up to the segment banner – to help with that last moment burn. 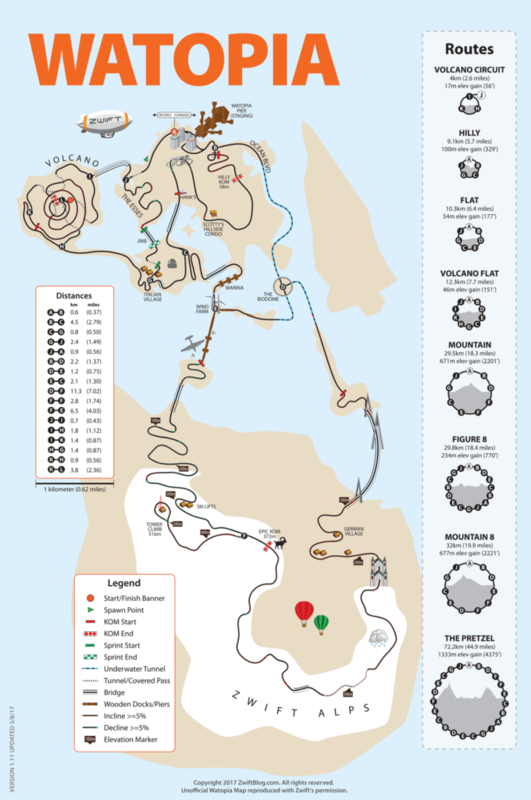 Awarded to the rider who rides the fastest lap around the whole of the Watopia track, from the start checkpoint and back again – as such there is no “white line” start point, the banner is its own start and finish point. Segment time approx 13-14mins in either direction if you are wanting to bag yourself a jersey! 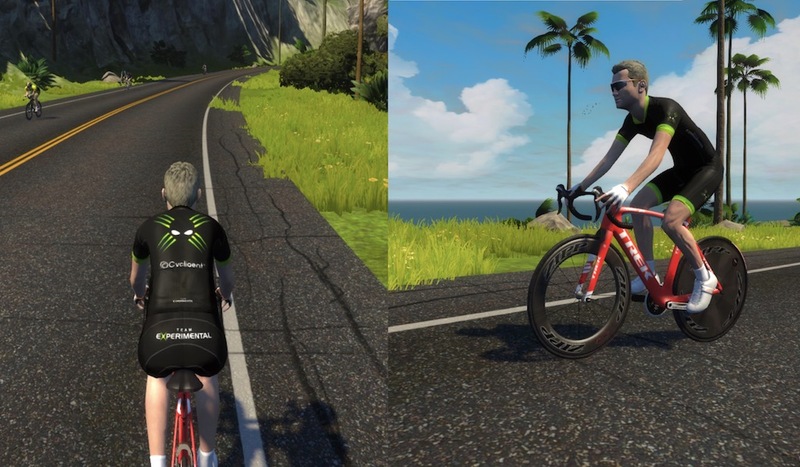 If you ascend Zwift Moutain and are the fastest passing the goat at 372m above sea level, you get to wear the Goat KOM. Far less of these are seen! A double jersey is available comprising two of the three segment leader jerseys – your rider name on the right-hand list also changes to a graphic comprising of elements from both. 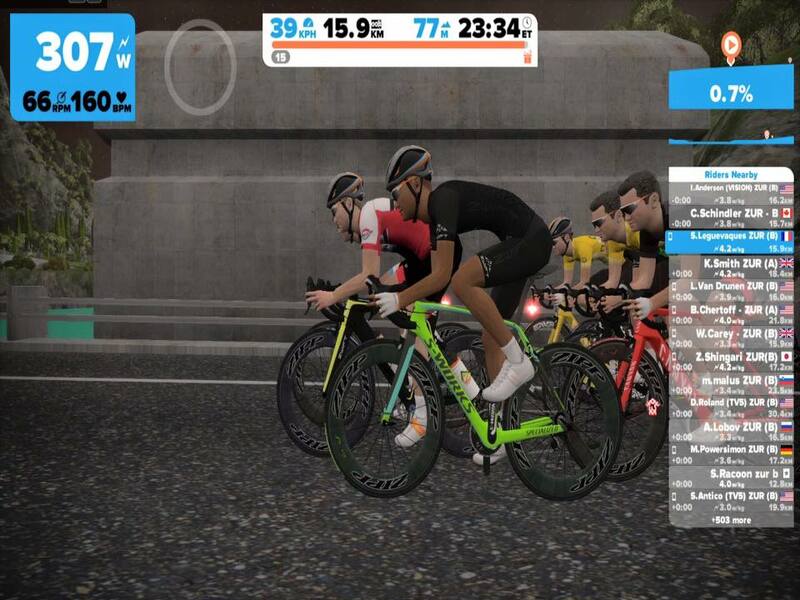 If you are extremely fit/lucky, there is also Super Jersey comprising all three colours – should you be able to take all three section jerseys when you are logged in. 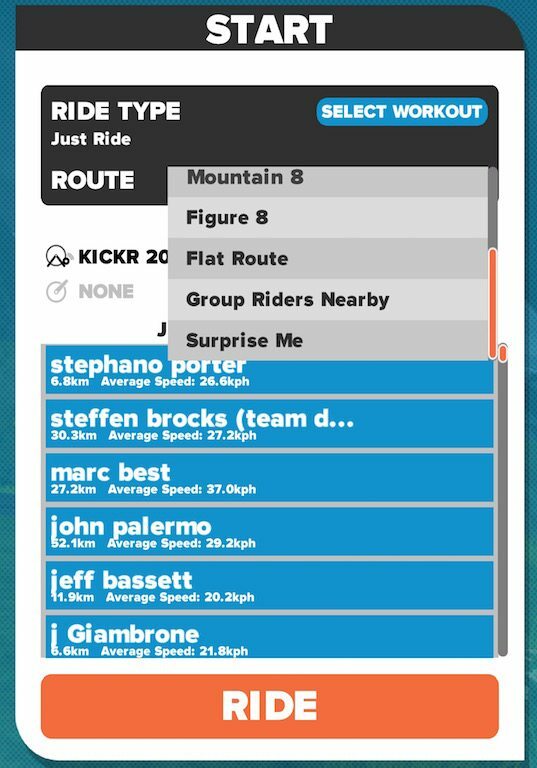 Your rider name on the right-hand list again changes to a graphic now comprising elements of all three. But if that’s too easy, there is also all six jerseys to get, as don’t forget you can do the same in the reverse! 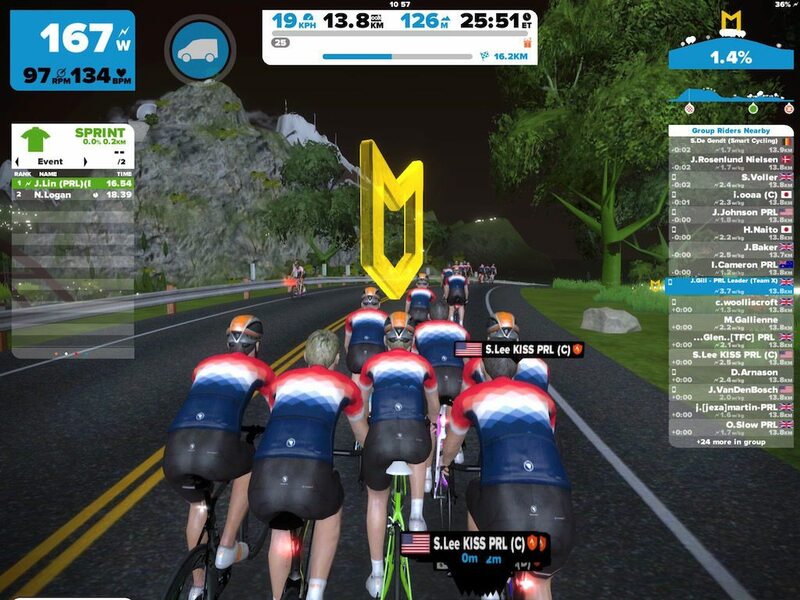 When you have held the jersey for the 60mins, a small count down timer appears next to your time on the leader board, indicating that you will shortly surrender the jersey – but dont worry, you can just re-earn it! 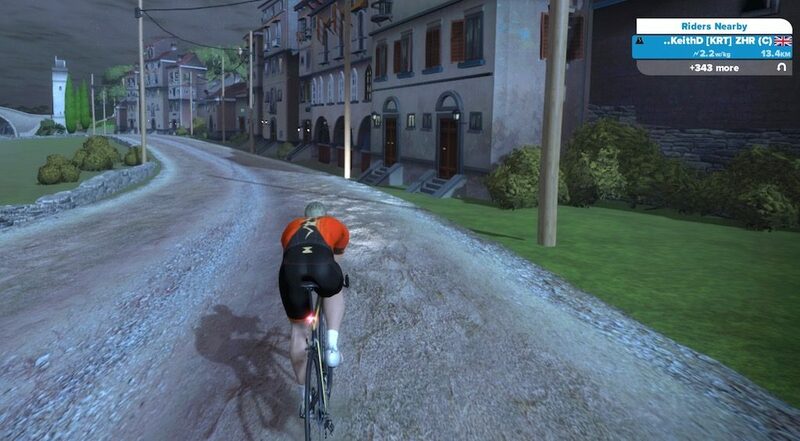 When you do a U-turn (Down arrow on keyboard) your jersey however will disappear (!!) – as there are 3 jerseys in each direction. You don’t however lose the jersey. 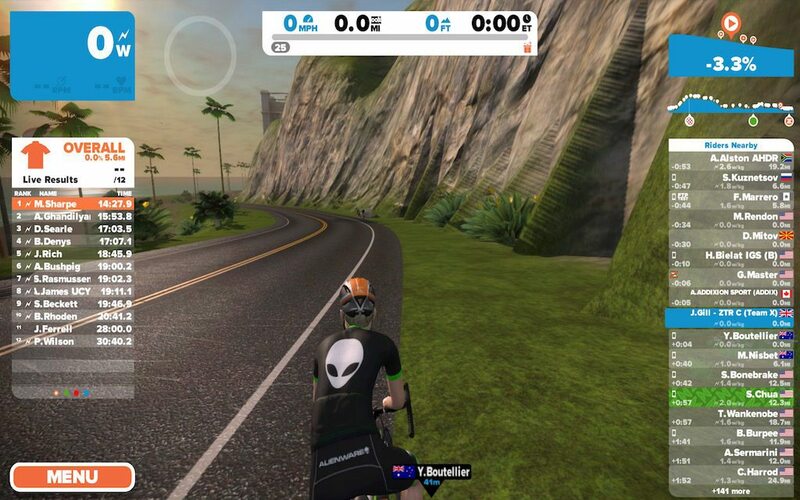 An icon indicating the respective jerseys you’ve won appears next to your name on the riders list indicating that you hold that jersey, but in the opposite direction (each direction has separate leaderboards). With the Boulevard extension also comes the option to take turns whilst riding, thankfully none of the riders crash on the intersections, although I’ll admit to closing my eyes on the turns, they are TIGHT! 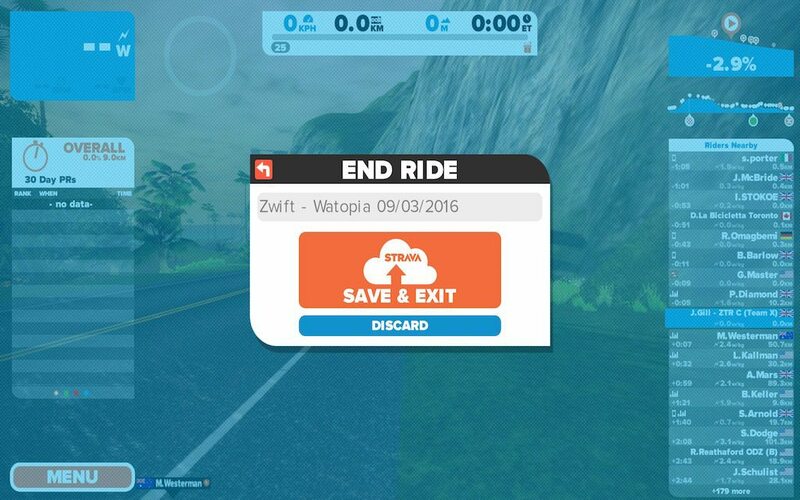 When you first logged into Zwift, you were given options about your Watopia route. 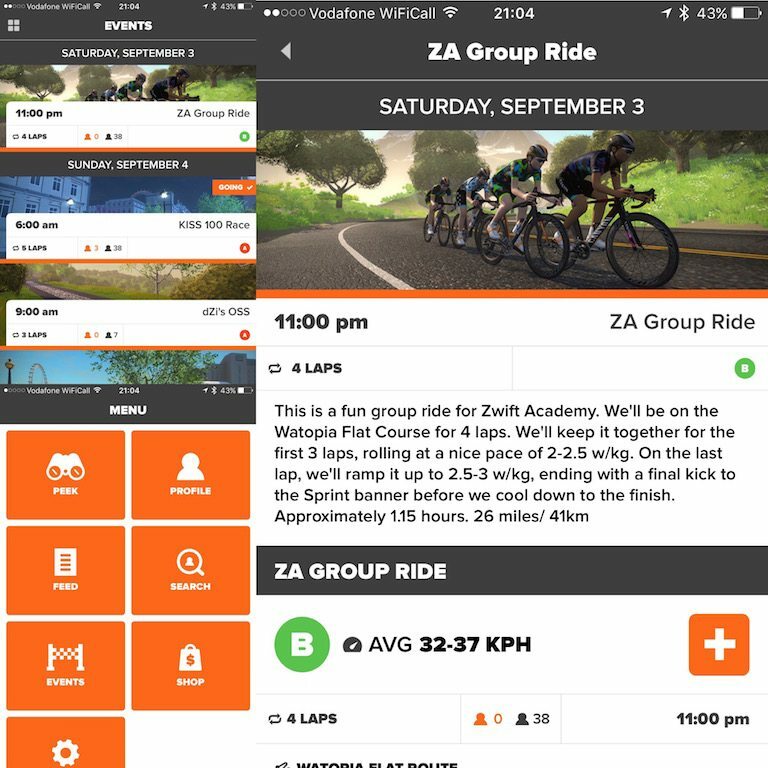 Flat takes you via Ocean Boulevard, Hills over the KOM on Watopia, whilst Group will following the peloton you riding and drafting with. Choosing any of these will make the requisite automatic turns. 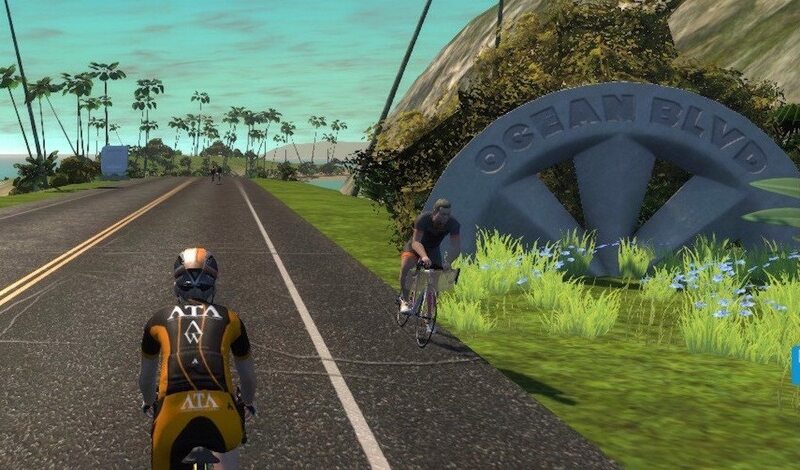 Coming from the initial log in, or ‘Ride’ point in the forwards direction, it is approximately 1km to the turn onto Ocean Boulevard, which is just longer a fraction longer at 10.3 vs 9.7km going over the KOM, but Ocean Boulevard is very flat, and great for a TT run. To turn using the phone app, you have to be on the “Actions” pane, and the top two icons will change from “Elbow flick” and ‘Wave” to the turn buttons. Thankfully the dirt track doesn’t affect your speed! At the start choosing a specific event was mentioned when you initially log in. 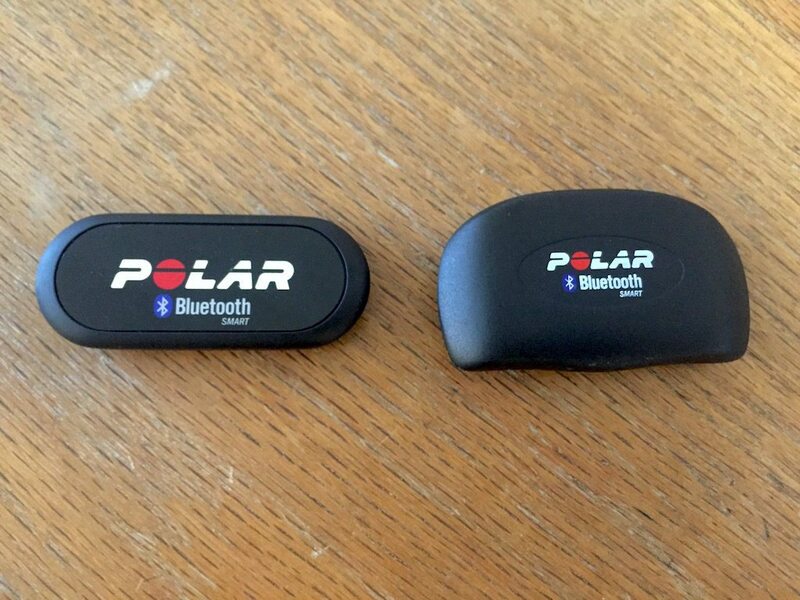 This will put you in a specific race or ride event. 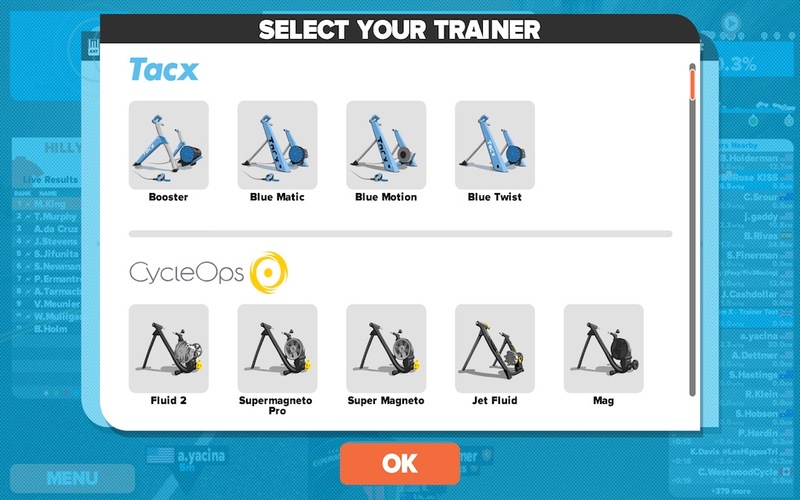 When you log in, afte having selected an event, blue box appears in the bottom LEFT of your screen saying “join” when you have started to ride. 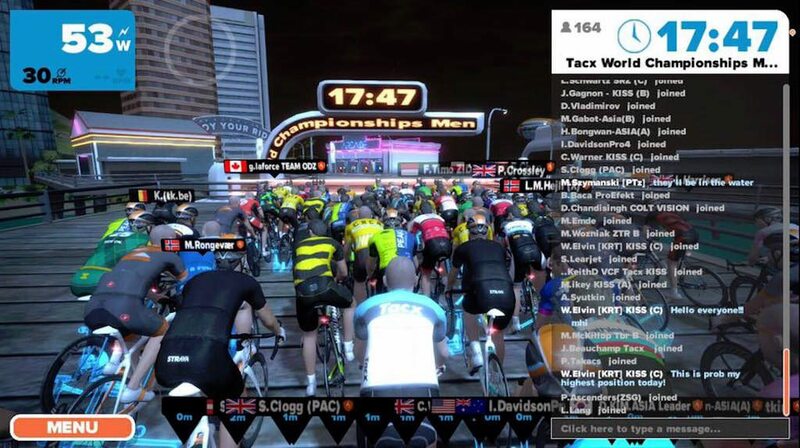 On the top RIGHT you can see the count down timer before the race (useful if you realise you have forgotten to fill your bottles) plus a count of how many riders are currently participating in that event. You can also message each other on the RIGHT message screen. 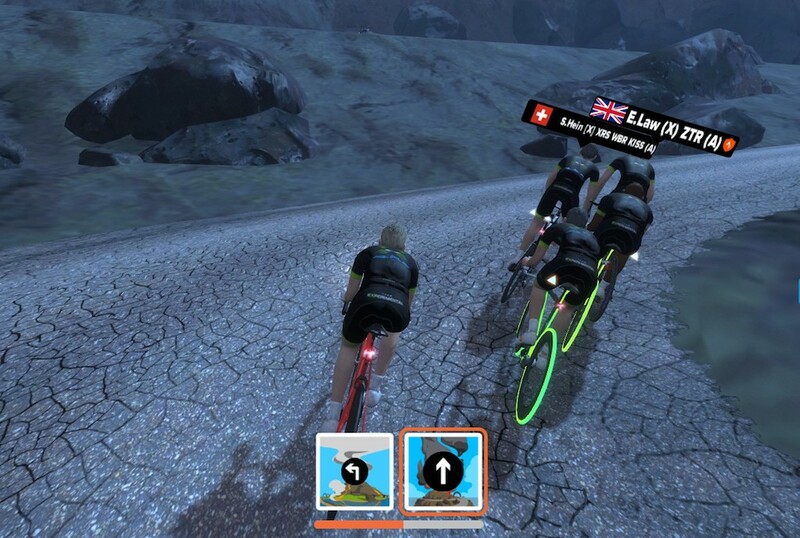 The messages, when typed in an event mode, are only visible to riders in that event, rather than the whole of the Zwift game. 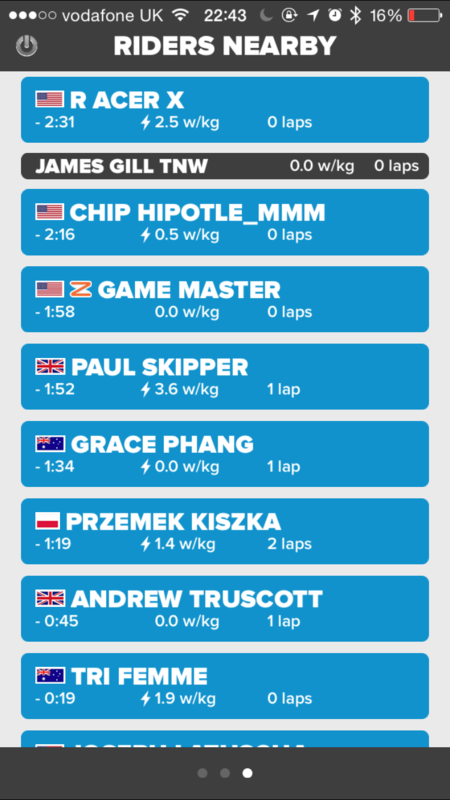 The top bar during an event also changes to show your lap counts, and the total distance remaining – nice touch! 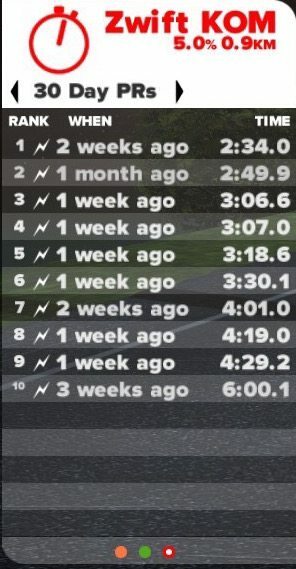 Note that the above picture is from a RACE. In a RIDE event, there is a group leader, who sets the pace for the group. The ride leader is identified by the yellow rotating shield over their riders avatar. 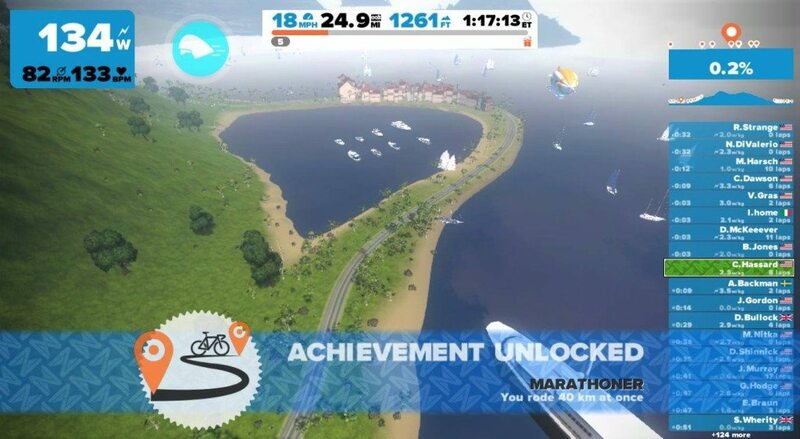 The map covers all of the current extensions to the Watopia island, and if there is one thing we know from Eric Min the Zwift CEO is that Watopia has the space to grow, so make sure you check back after the next inevitable extension – kudos on the Zwift blimp! As mentioned earlier there are two boosts that give extra points. 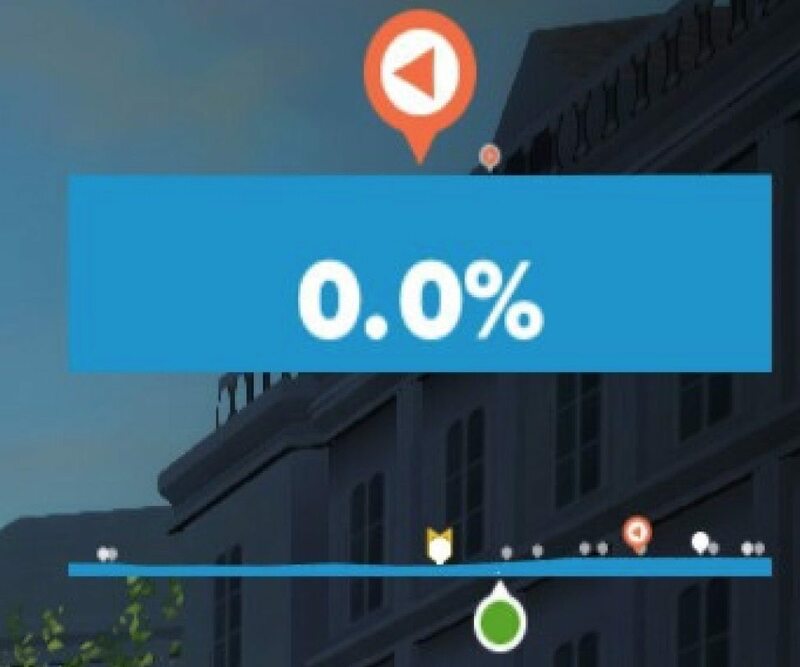 The points fill up your orange bar in the top of the screen. 1 mile is worth 30 points. When the bar has been filled up, you level up. Points and levels mean prizes! 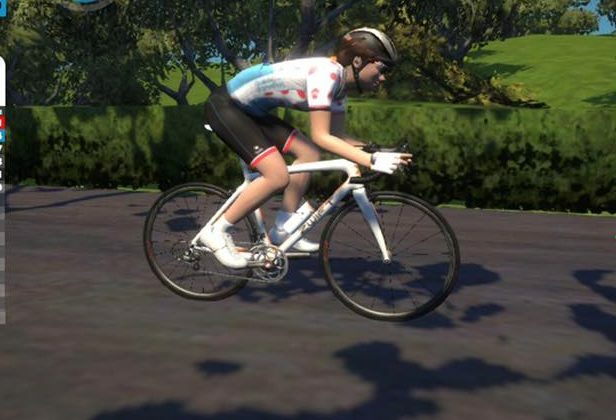 Currently, this is just graphical bling but there is a plan to have the gear you ride in, be affected by the worlds physics – so that could lead to an “All Steel Bike” race etc. 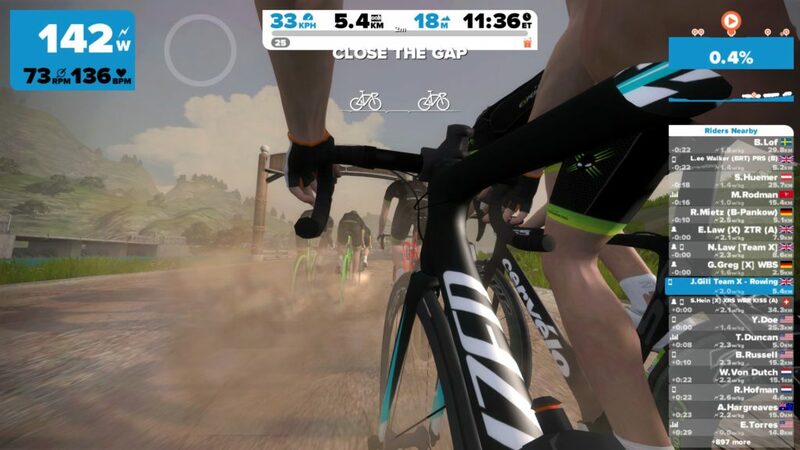 How Many Miles for Zwift Levels? 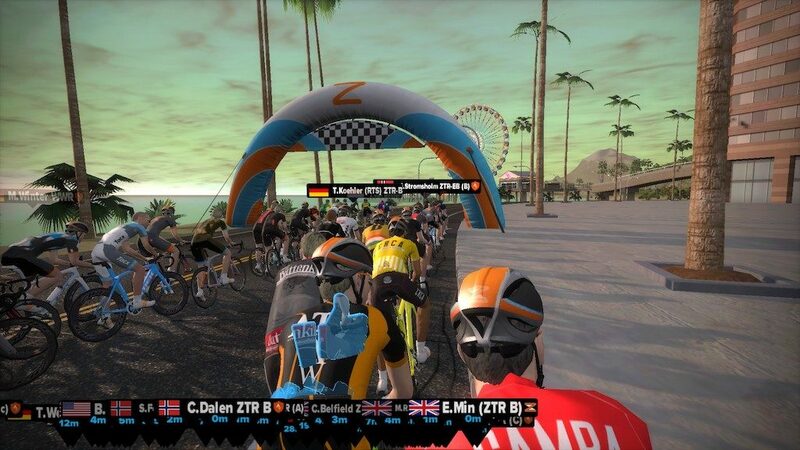 Zwift from time to time does events and team ups. As a result of this, certain bikes and kits become available temporarily. Here are a few of them we’ve had in the past. 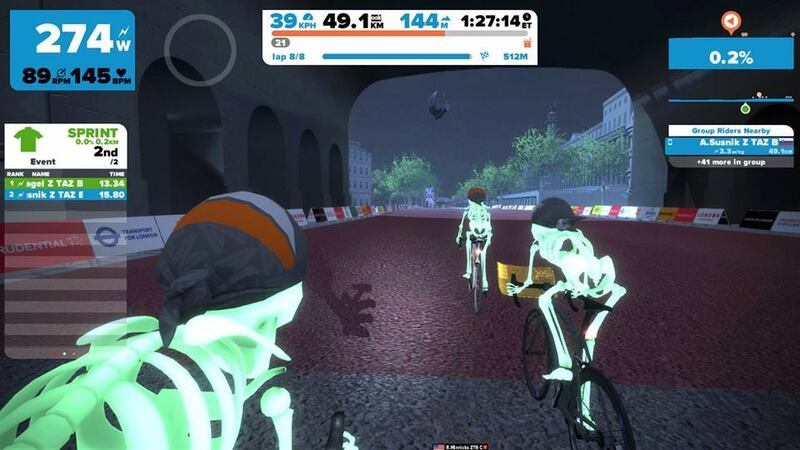 For Halloween we all shed a few Kg’s and ride as skeleton! 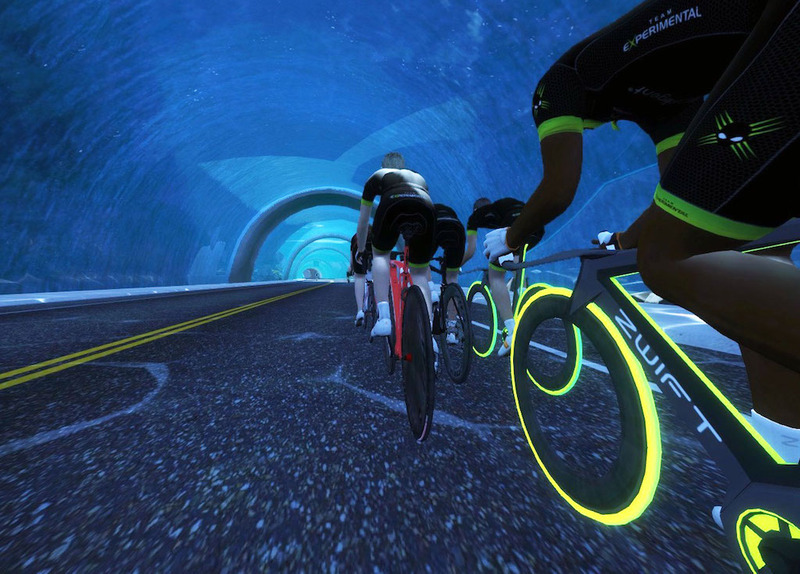 There is a “Tron” Bike unlocked when you hit 50,000m on the Everest Challenge, and it looks sooooo cool! – Props the Legend that is Jeremy Samuels for busting a gut to confirm the theory! You certainly see them coming! 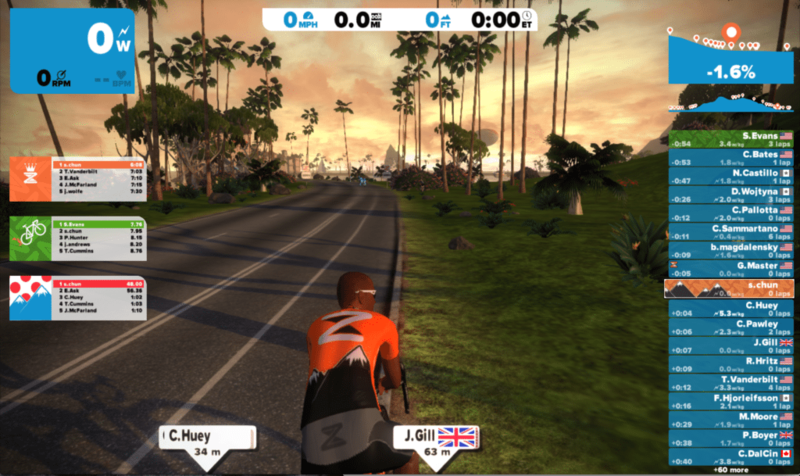 But I’ve seen upwards of 400+ riders on the island at the same time, and you dont really want to look down that number of people to find your mates, so Zwift allows you to follow people, as on Strava or Facebook, which then also shows who is riding as well. “Elbow flick”, “Wave”, “Bell”, “Hammer time”, “I’m toast”, “Ride ON!” and “Nice” – are all purely gestures. “Snap shot” does exactly what is says on the tin. 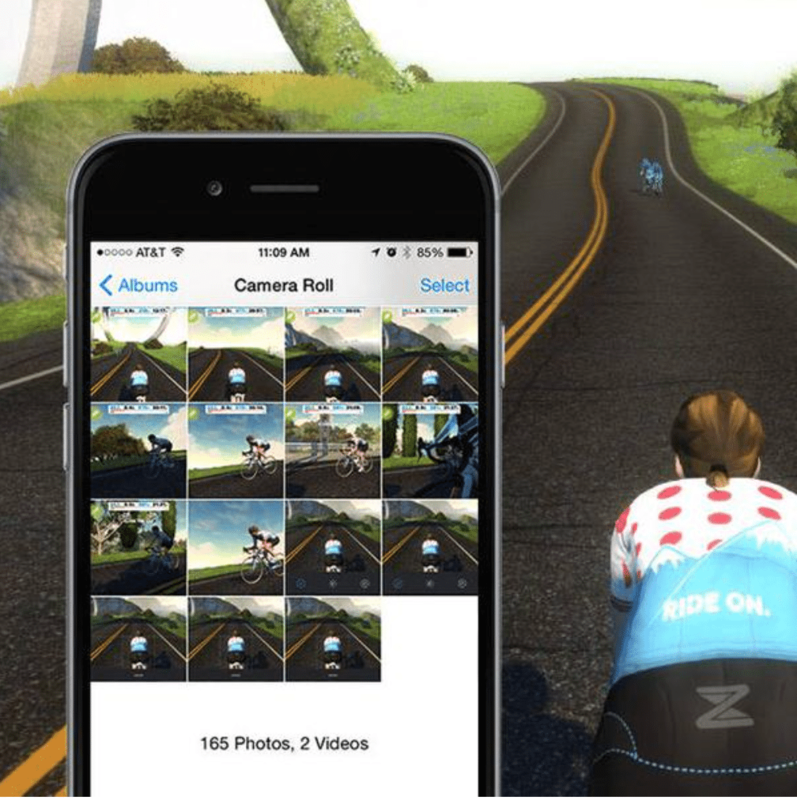 Allows you to take photos of you rocking that green jersey! 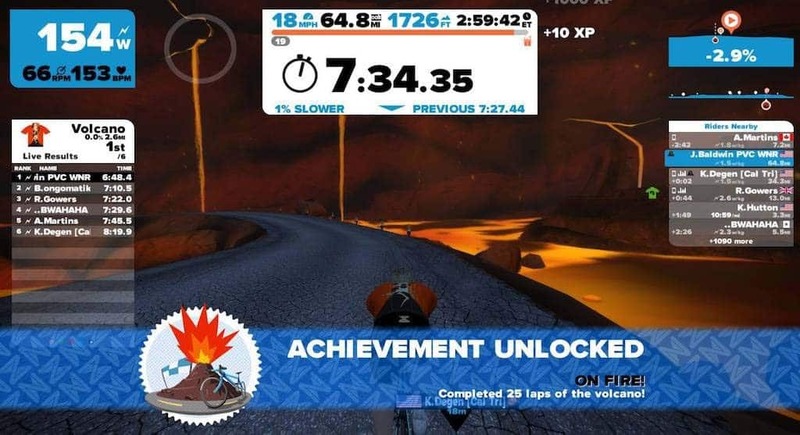 These photos are now stored on your phone, whereas previously they were stored on the computer running Zwift – makes things easier for FB bragging now! 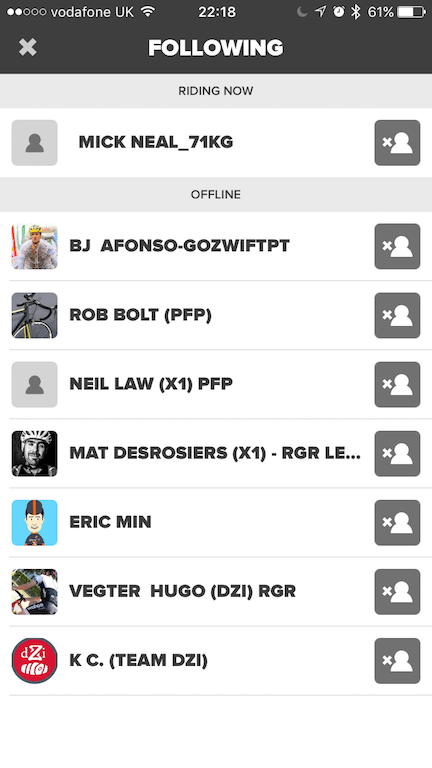 “Group Text” – allows you to send shout outs to all the riders on Zwift within a 1.5km radius – useful for co-ordinating group ride starts etc. 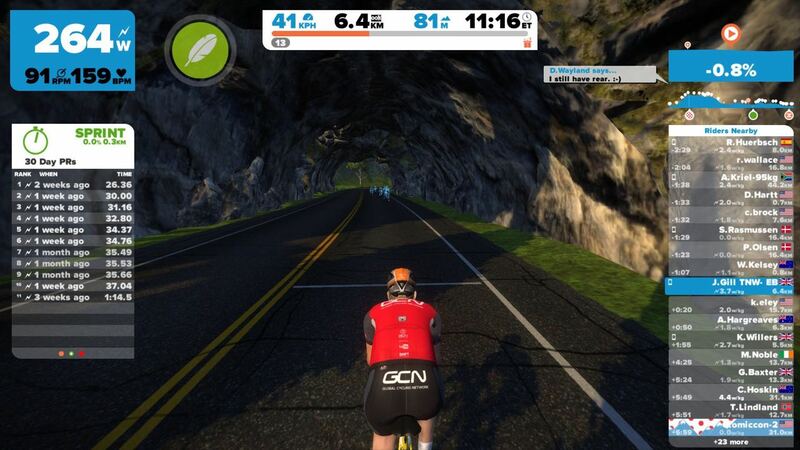 “Switch view” – like the keyboard camera angles. To help you get a better photo of that rocking’ jersey! 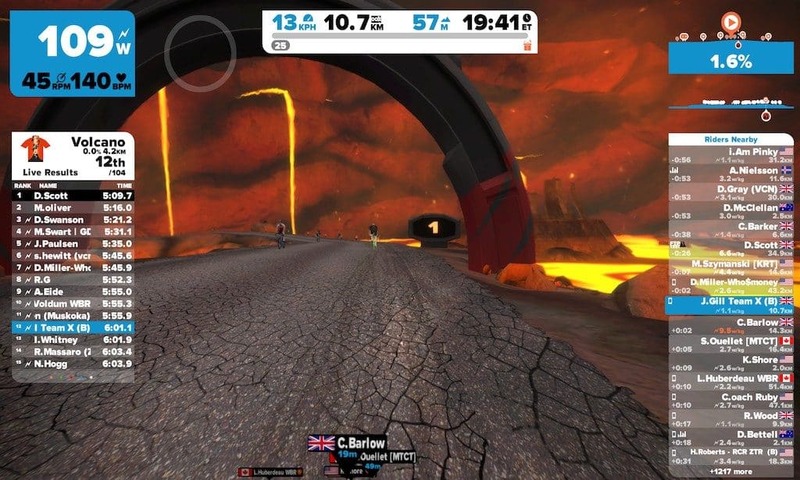 The messaging app in Zwift is very useful, but there any many people that dont want to trust how well their technology is likely to last with a sweaty keyboard or screen. 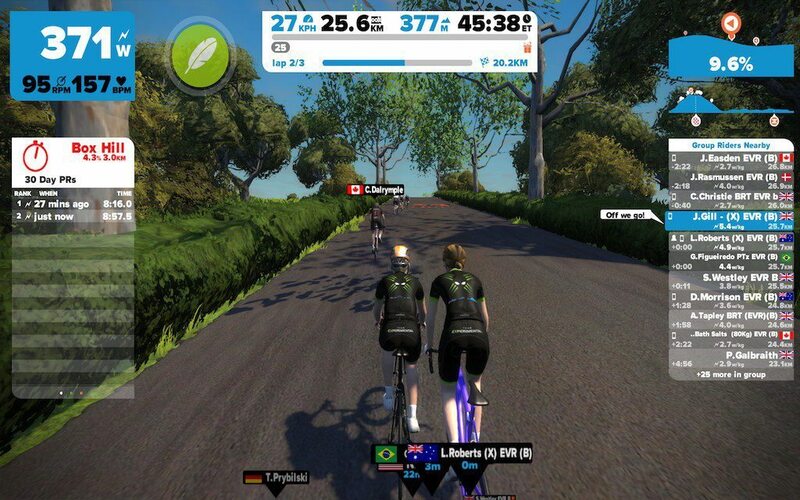 As a result a lot of people have started looking at TeamSpeak as an alternative communication tool during races. 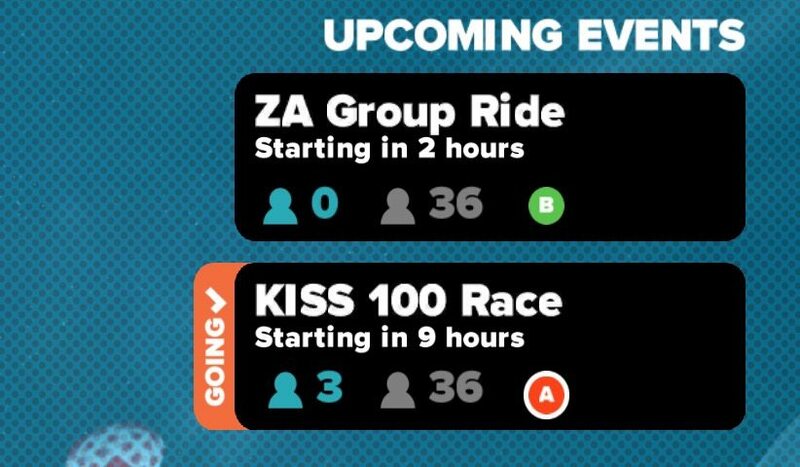 There are a series of regular rides that have grown up on Watopia through the various Facebook groups for the Zwift Community. 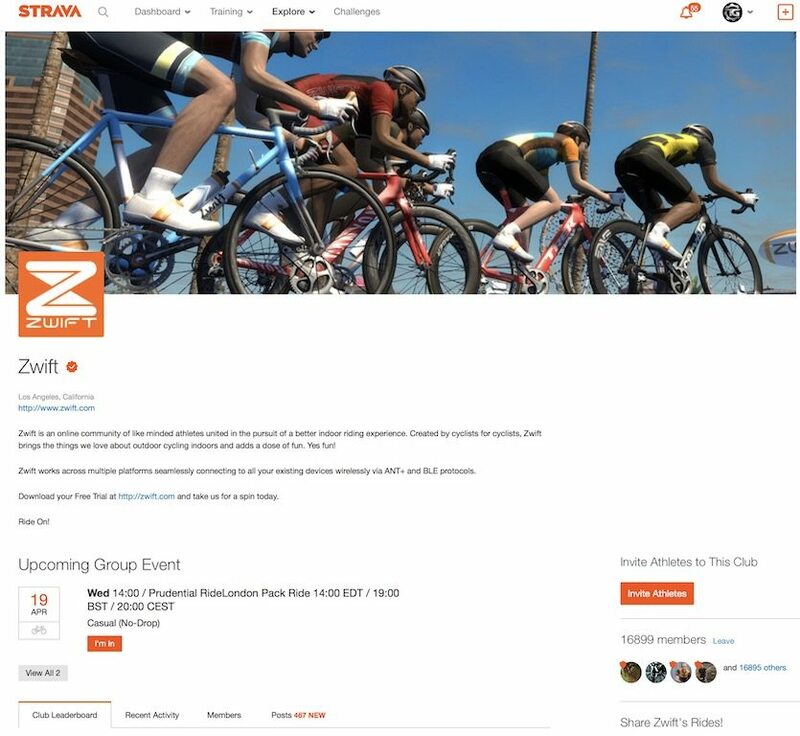 When you’ve had a look at the types of rides which are available, and you know the rides you’d like participate in, the Zwift Riders Michael Neal and William Kwan have produced a TeamUp calendar which holds all the various races running each week – as you can see some days get a little crowded! Best of all, because of the nature of the calendar, it puts everything in relation to YOUR time zone – my poor brain can stop trying to work out which of Australia’s many time zones a “late morning” UK race is over there! 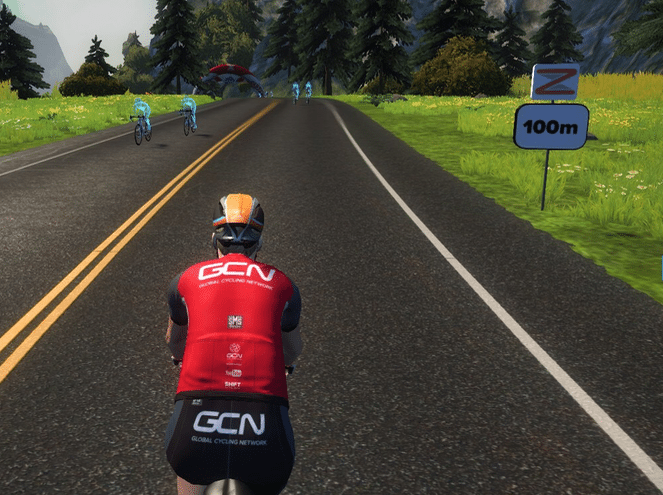 Coming soon – Event mode – no more neutrals! 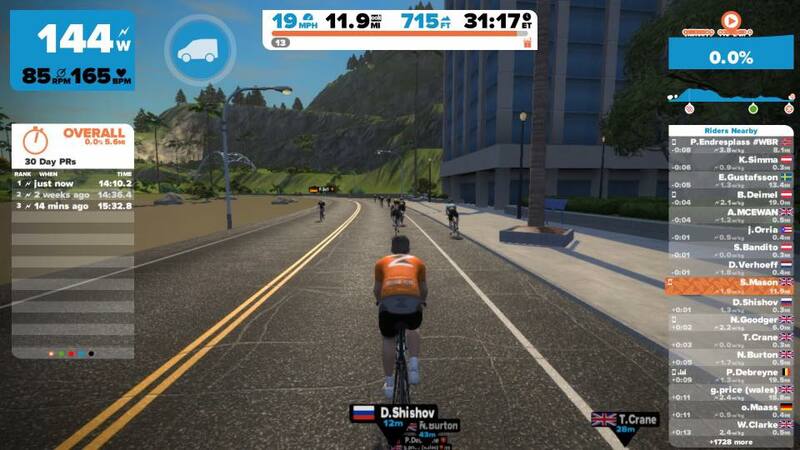 Zwift HQ have flipped the switch on one of their most hotly anticipated software upgrade – Zwift Workout mode. 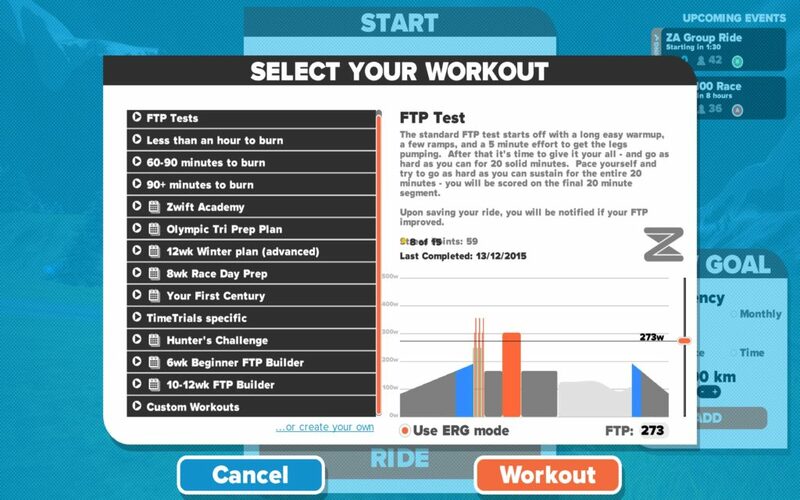 Everything you need to understand the Workout Mode is here! Zwift has released their iOS app via the Apple App store. 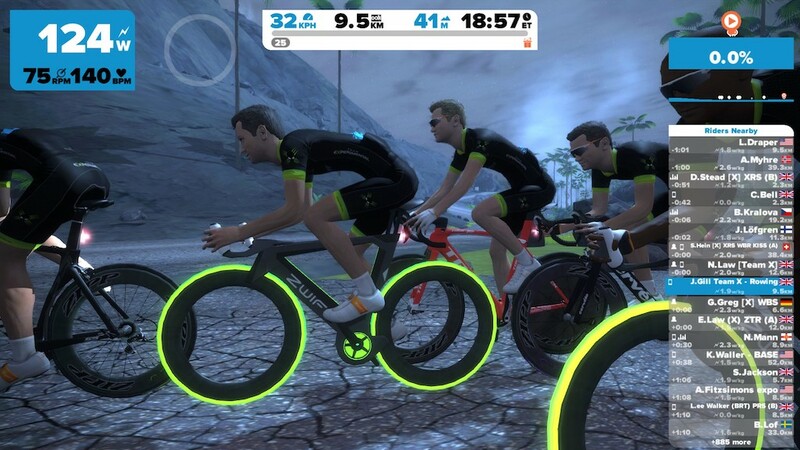 However, the Zwift team are a group who could NEVER be accused of sitting still. 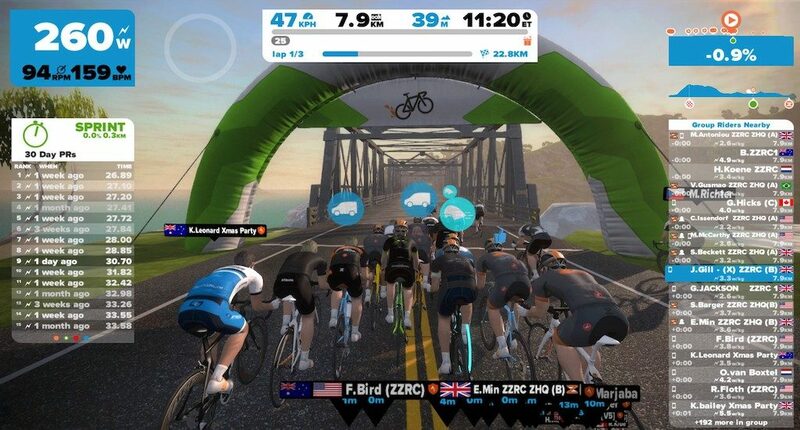 As a result, they have also slipped an easter egg of the Zwift running module with the app! 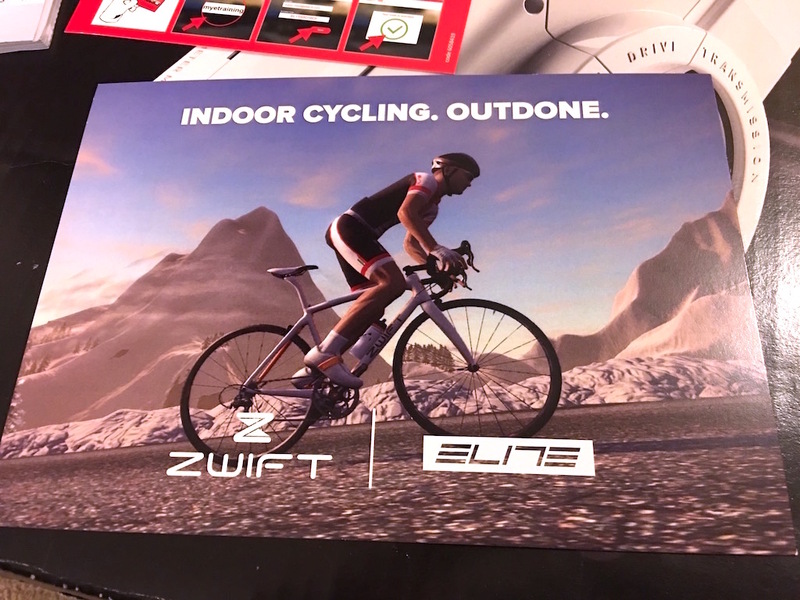 Without a doubt Zwift is DEFINATELY going to transform the indoor running scene in the way they have the indoor cycling world. 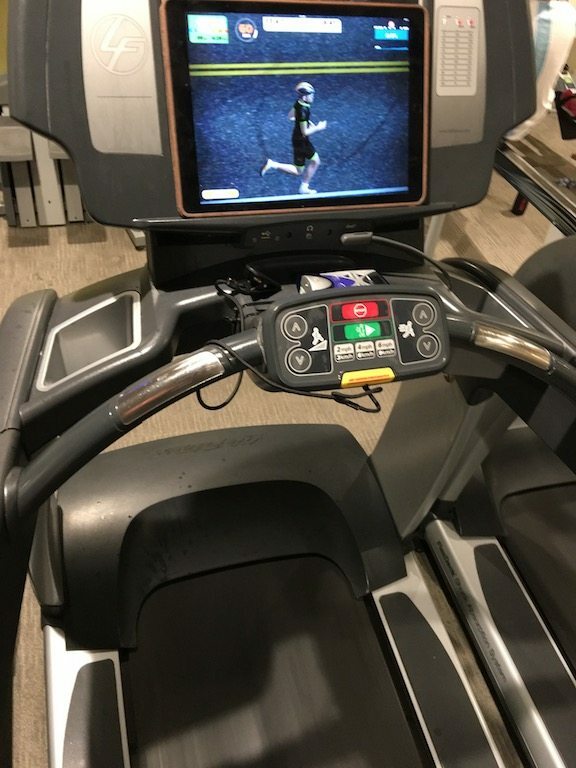 Especially as you can just lean your iPad or iPhone on any treadmill – I get a few odd looks when I use it at the local gym! 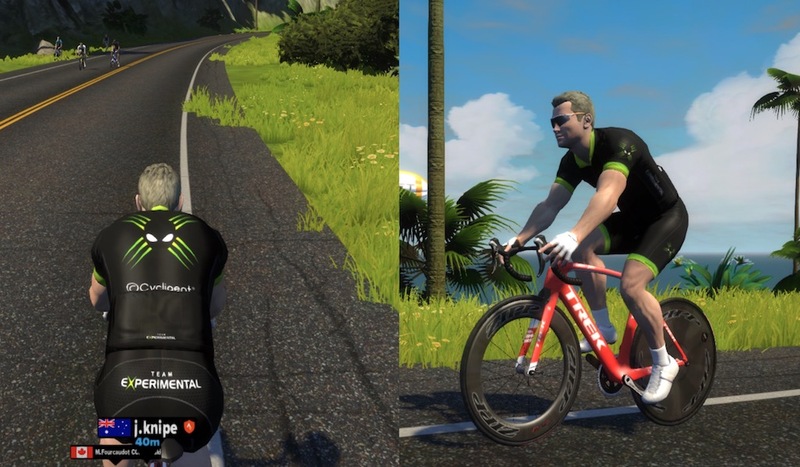 The Zwift team are very cool, and there are easter eggs hidden in the game. 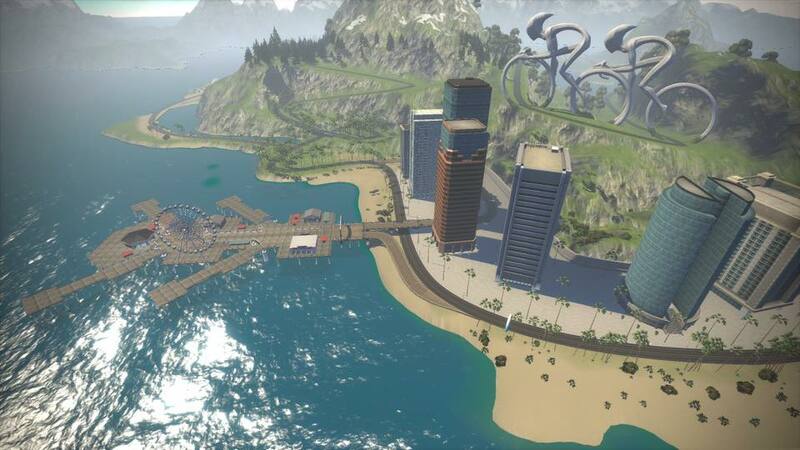 One bridge has JWB stencilled on the side of it, as a tribute to one of the games Beta testers Julynn Washington, after a banter filled Facebook post once night. 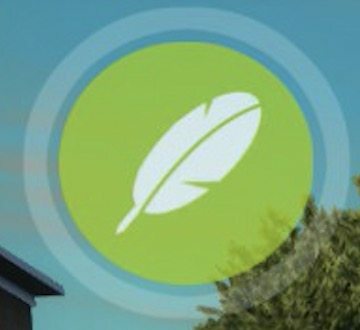 It’s great that the development team REALLY integrates with the community and listens. Finally found him! On Watopia he’s sitting on top of the gas station! Take a look, and if you see him, stick it on Twitter and FB! !